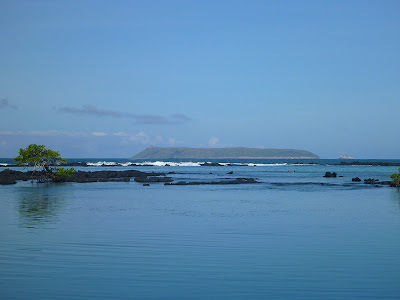 Before arriving at Isabela, we had read that this was a calm, protected anchorage, though smaller than it looked due to all the rocks and reefs in the anchorage. 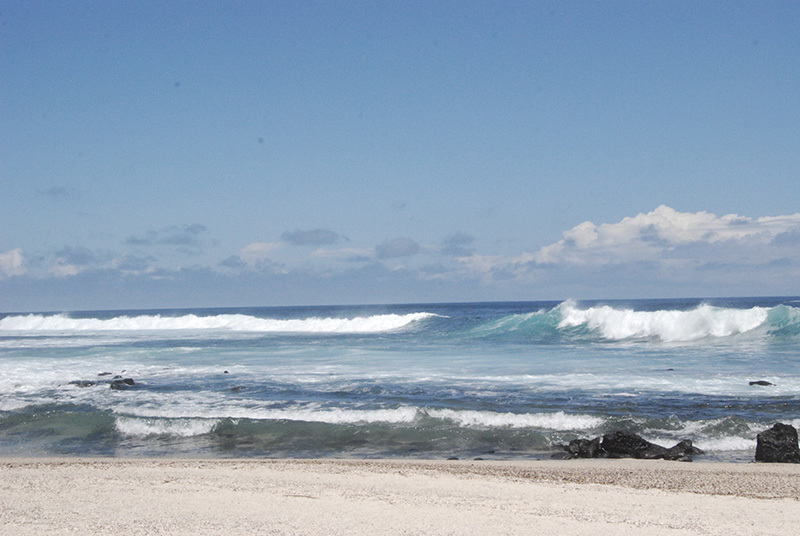 The latter part proved to be true, but we found Puerto Villamil to be almost as rolly as Puerto Ayora. 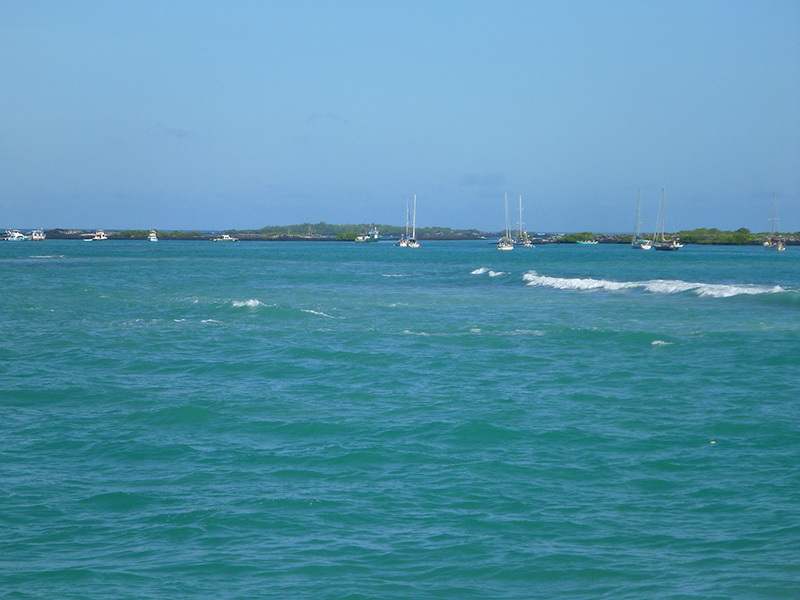 Even though there were far fewer boats in the harbor than on both San Cristobal and Santa Cruz---and only a few water taxis---the swells created by the tour boats constantly zipping in and out of the harbor contributed to the motion in the anchorage. My overall impression of the island when we were there was one of relentless surf, and one of the local people we met mentioned that the waves were high during our visit, so perhaps that was a contributing factor as well. Indeed, on our last night at anchor in Puerto Villamil, we experienced the calmest night we'd had at anchor there, so it may have indicated a shift in the weather. I cleaned Silhouette's waterline, bow, and transom while at anchor in Puerto Villamil. 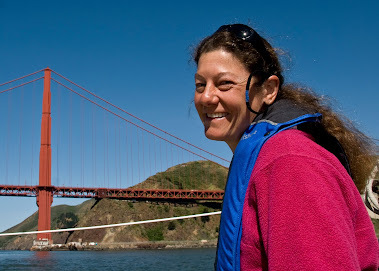 While cleaning the transom, I was either hanging on to the wind vane mount with one hand to keep from streaming backwards with the current, or trying to keep from being bumped on the head by the hull as the boat rode up and down with the swell. Conditions were not ideal, but I managed to remove the majority of the growth that would slow the boat down on our next passage. Hopefully, the next time that job is done, it will be in the calm waters of a placid tropical lagoon. 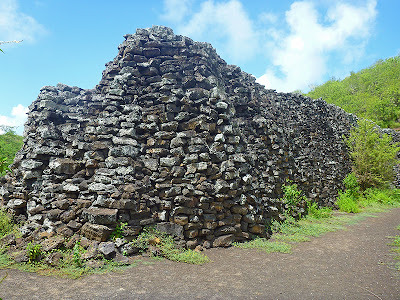 We had heard that Isla Isabela was the "best" island in the Galapagos in terms of things to see, and I was eager to explore it. 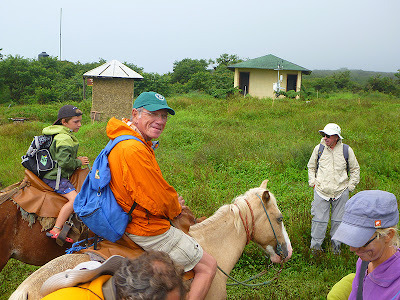 However, I found that Isabela was less accessible in terms of things to see and do locally without a paid, guided tour. Cruisers are no longer allowed to visit Las Tintoreras, the series of islets surrounding the anchorage in which white tipped sharks and Galápagos penguins are found, in their dinghies. They must go on a guided tour. 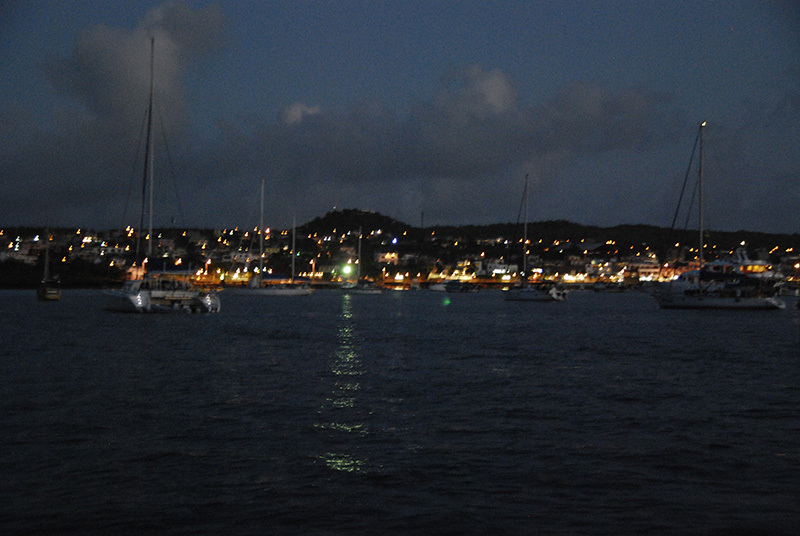 The port has set up orange floats beyond which cruisers are not supposed to take their dinghies or snorkel. Luckily, the wildlife doesn't recognize the orange floats, and one can see fish, bat rays, sea turtles, sea lions, and penguins swimming right through the anchorage. 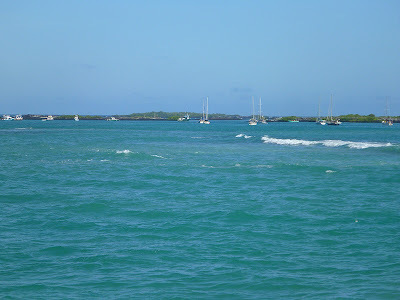 It would be easy to swim over from your boat and explore the outer edges of Las Tintoreras, as well as the reefs extending into the anchorage; however, the traffic and swell conditions in the anchorage did not make this feasible during the short time I was there. 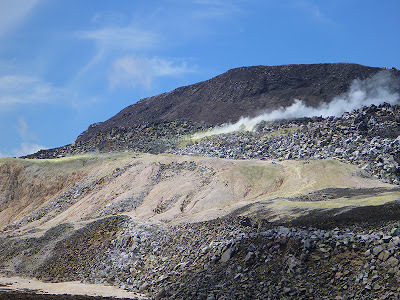 We also did not take the snorkeling tour of Los Tuneles (lava tunnels), although we heard from other cruisers that this was a disappointment. They were not allowed to snorkel in the calm waters of Los Tuneles; the snorkeling spot on the tour was somewhere else with poorer visibility. 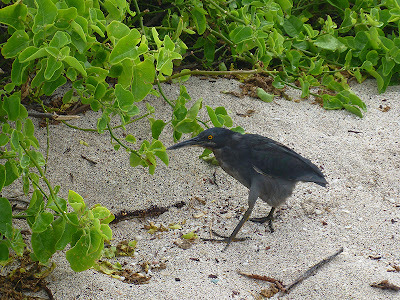 The mangroves next to the dinghy dock house a plethora of wildlife, and you can see many sea lion pups and marine iguanas there. The local hangout touted by our guidebook as a great snorkeling spot, "Concha y Perla," was disappointing in its low diversity. 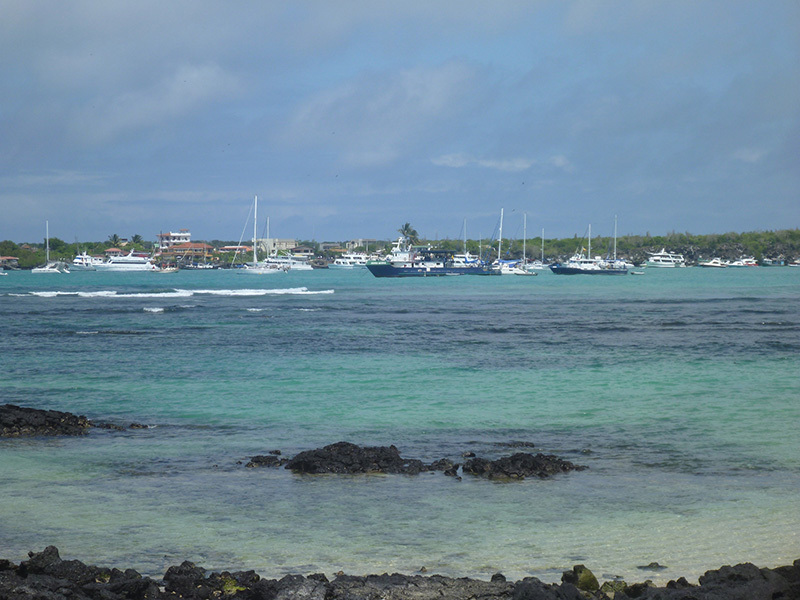 Low tide is best, and the farther you go out on the reef, the more you can see; but you have to be aware of tricky currents both in this area and in the channel between the snorkeling hole and the embarcadero. The sight of mangrove roots extending over the underwater lava flows was eerie and unique. 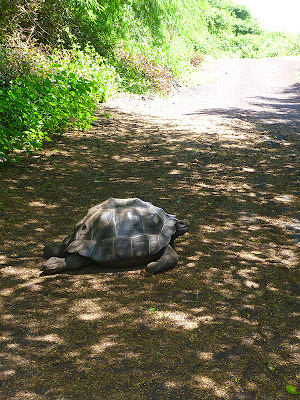 We didn't visit the tortoise breeding facility on this island. Although I was curious about the subspecies on Isabela (supposedly the largest in the Galápagos), we had seen a lot of tortoises on the other islands and were interested in a new experience. On our first day in town, we checked out Laguna de Sal and found a stagnant, algae filled pond with a solitary flamingo. On the second day, we rented bikes for the 10 km round trip to the Wall of Tears. 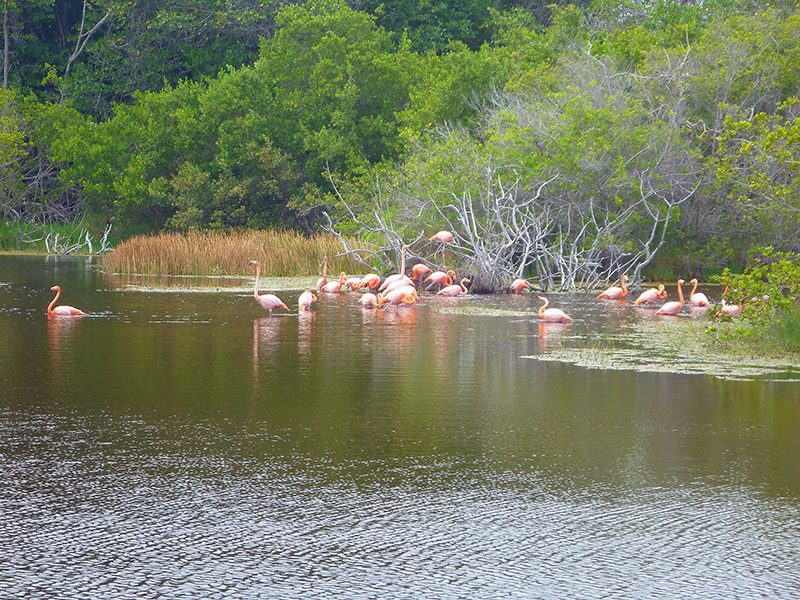 Along the way, we saw the entire flock of flamingos at a much healthier looking Poza de las Diablas (a lagoon). I would recommend this excursion, because there is a lot to see along the way. A short distance from town is Villamil's picturesque cemetery. As well as the flamingos, we saw huge numbers of marine iguanas at Playa del Amor and land tortoises along the upper reaches of the trail. 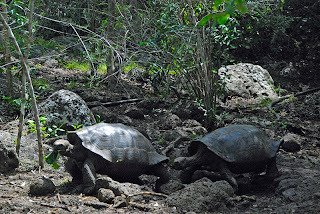 A family we met on our way back saw three sea turtles at one of the viewpoints along the coast, but the turtles had not been there when we had passed by earlier. Go on this outing prepared. 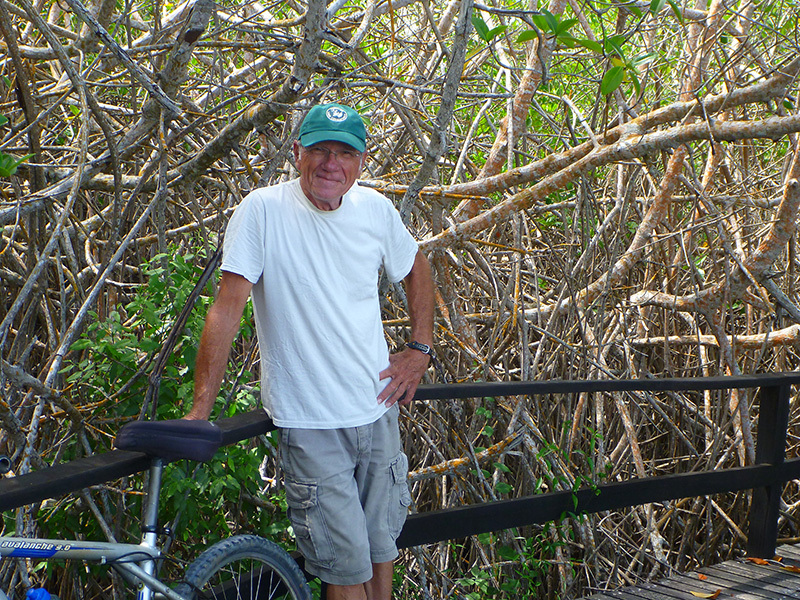 It is a long hike in the hot sun, so for us, mountain bikes were the perfect way to go. The one bathroom we saw along the trail was locked, and there is nowhere to get water once you start. Although we brought water, we did not bring enough. Exerting myself in the killer heat and climbing (both on the bike and on foot) after being at sea level for weeks, lead to me beginning to feel the effects of heat exhaustion. We passed plenty of other flushed faces along the way too. 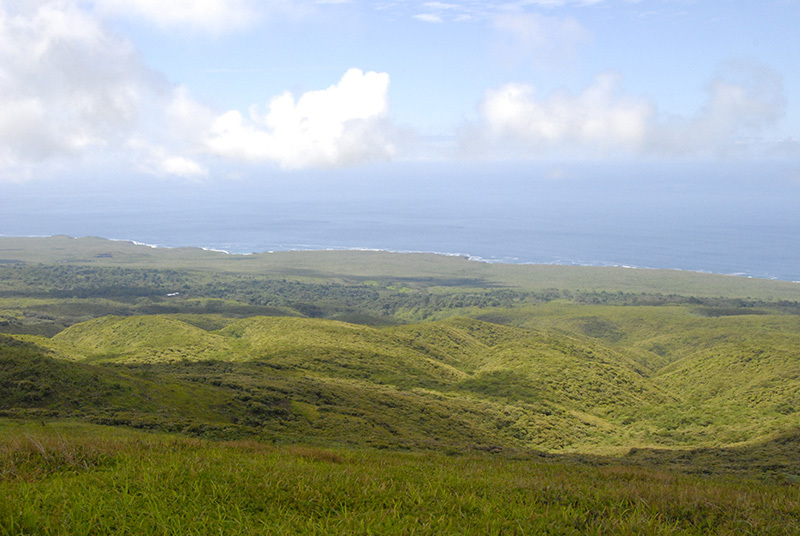 During the years 1946-1959, there was a penal colony located on Isla Isabela. As punishment, the prisoners were forced to build the Muro de las Lagrimas or "The Wall of Tears," an impressive stone wall made of blocks of lava intended to enclose them. Clearly, it was a project that was never finished. 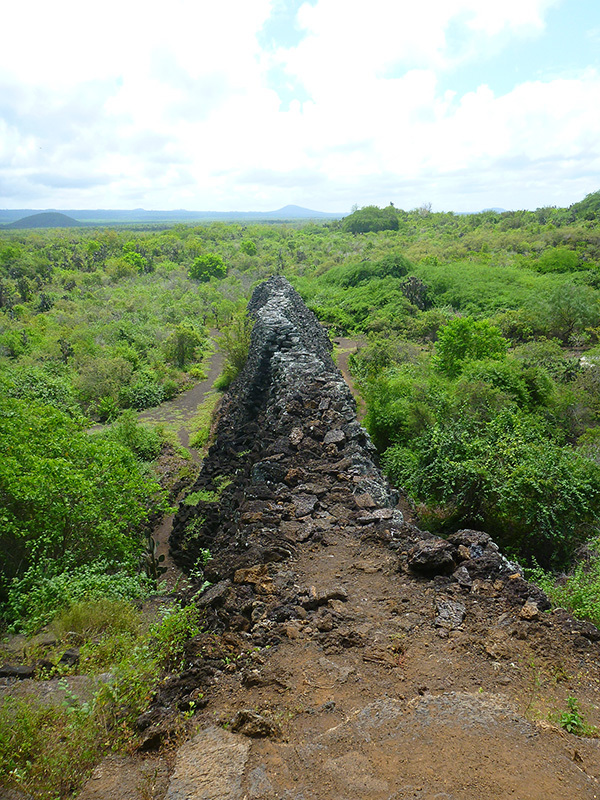 From the ridge above the wall (where one can imagine the guards keeping watch over the prisoners) excellent views of the island and Puerto Villamil can be had. 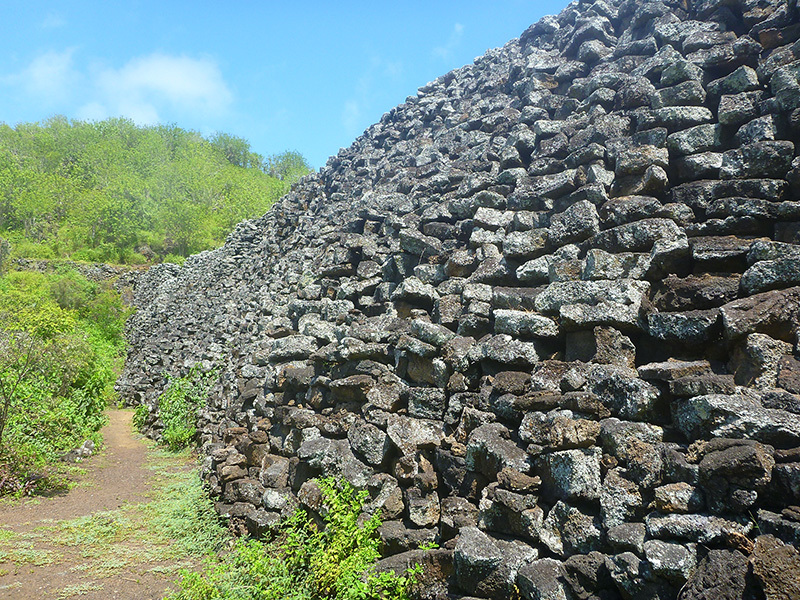 Near the Wall, you can also see the stone platforms that Americans from WWII built their barracks on. 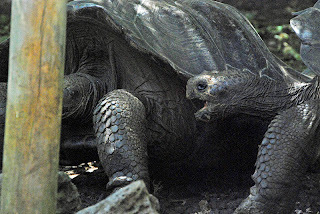 Before visiting the Galápagos, I wasn't aware of the American presence here during WWII. 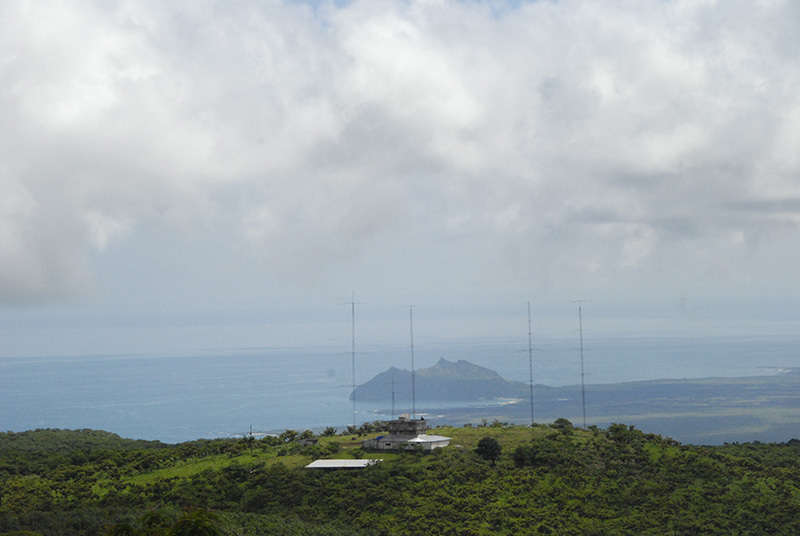 On Isabela, Americans monitored ship traffic for potential threats to the Panama Canal. 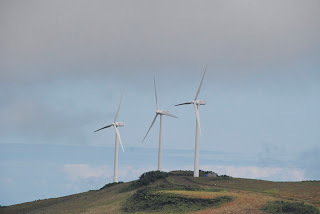 Our last day on Isla Isabela was to be our last day on land for the next three to four weeks, and we ended our trip with an epic adventure and a full dose of terra firma. One of the other cruisers in the anchorage had organized a guided tour and we participated, along with the organizer (a French-Canadian), his two boys, a French couple, and a German family with two kids. The four children on this trip ranged in age from two to eleven. It was great spending the day with the Canadians and Europeans, because the majority of the conversation was in French: a nice transition into our next destination in French Polynesia. Although neither of us speak the language yet, it gave us the chance to hear the accent of native speakers. 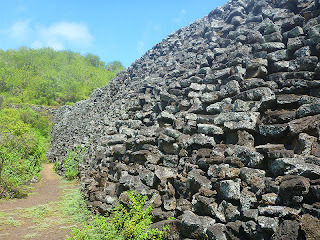 I even got one of the boys to teach me my numbers on the way to the volcano. 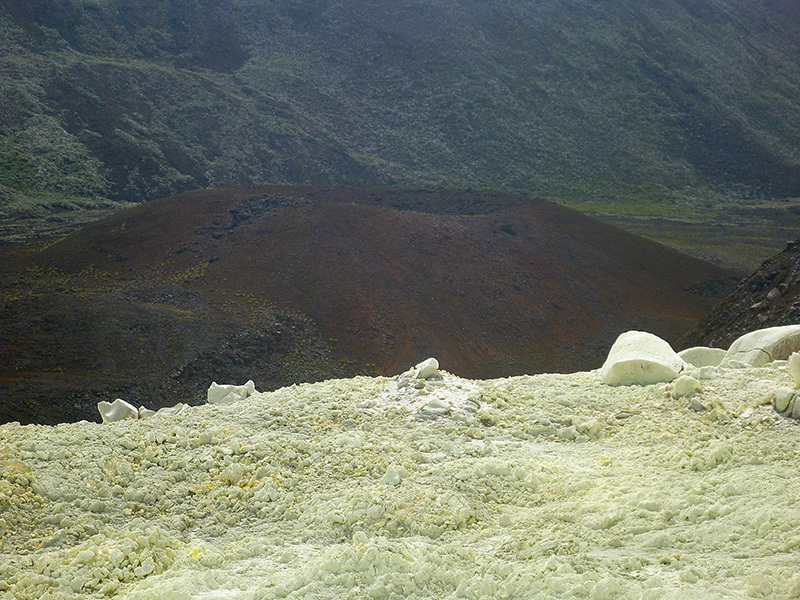 We stopped along the rim of the caldera, where we could see steam rising from the fumarole we were about to visit, and had lunch. 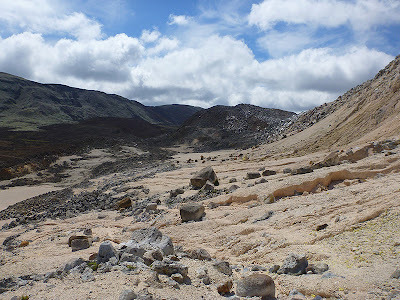 Then, we took a steep trail down into the caldera, hiked along a lava plain in which you could see the basaltic flows of the most recent eruption, and hiked up a slope of volcanic boulders and smaller debris. Slope of volcanic boulders with Kirsten "for scale"
This area of the volcano is locally called the sulfur mine, but the area is not actively being mined. It is called that because the sulfur deposits there are large enough to mine. 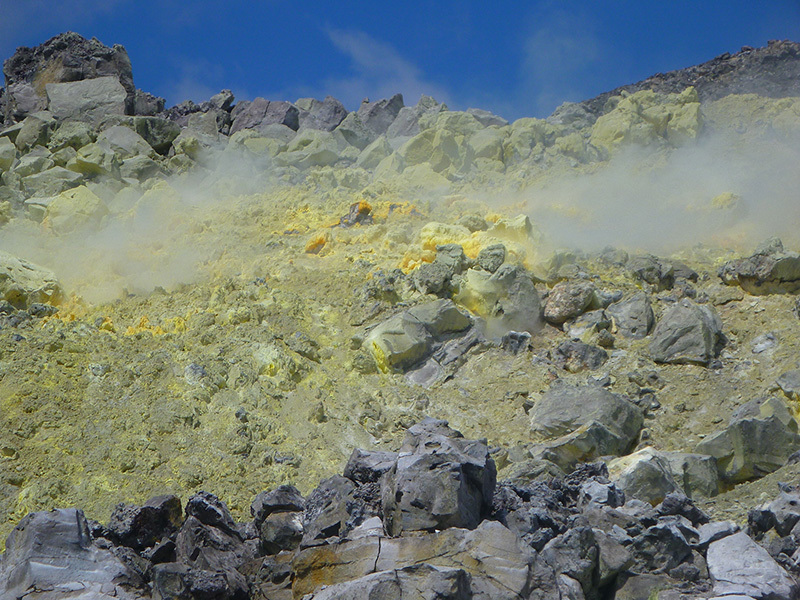 As we approached the fumarole, the ground was littered with chunks of sulfur. 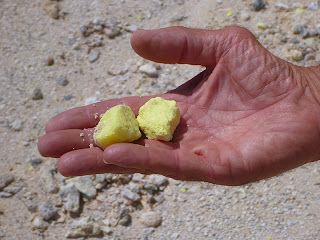 There were also an abundance of white and pink minerals that our guide told us were still primarily composed of sulfur, but that the sulfur was mixed with other elements like magnesium and iron. A fumarole is an area in which hot gases are escaping from an active volcano. At the sulfur mine on Volcán Sierra Negra, we were only 5 km---less than two miles!---above the magma chamber. 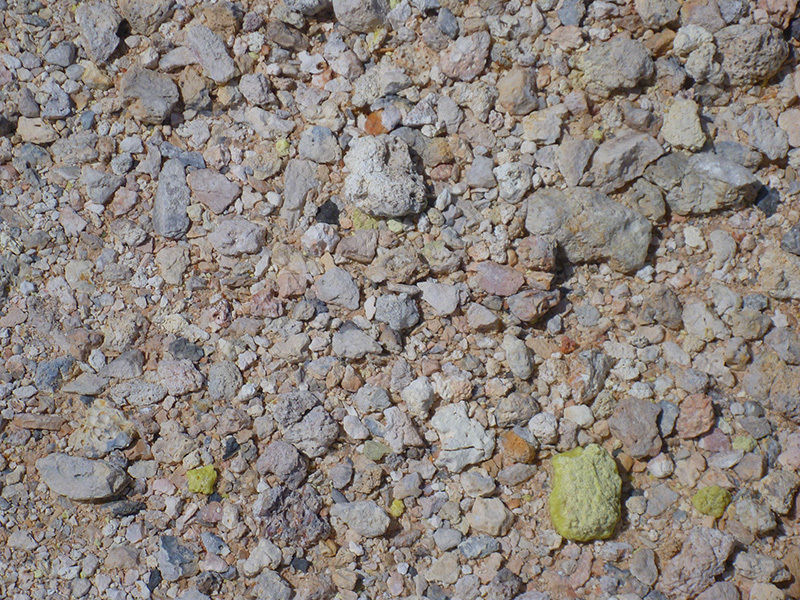 Here, we had a window into Earth's interior, the respiratory and excretory systems of our seemingly living planet. 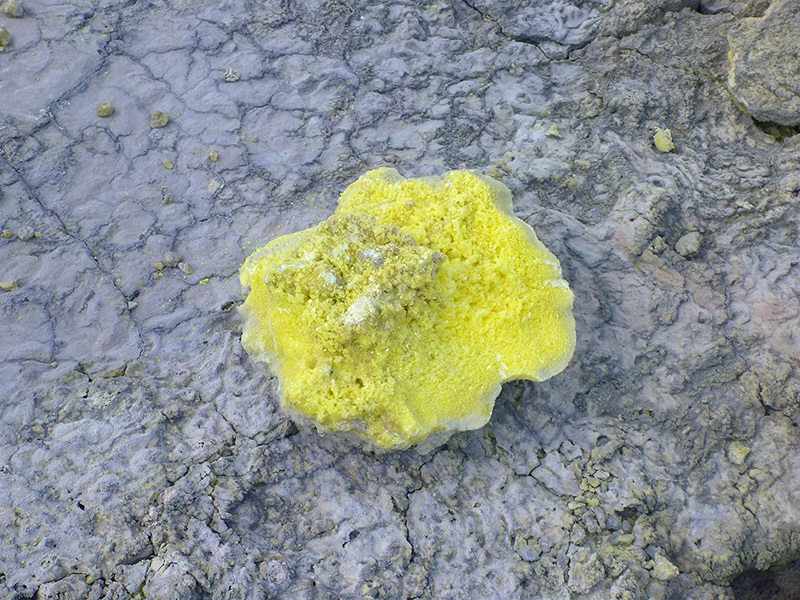 The ground around the fumarole was formed by a light yellow-gray sulfur crust. If you broke a piece off, bright yellow sulfur crystals composed the opposite side. 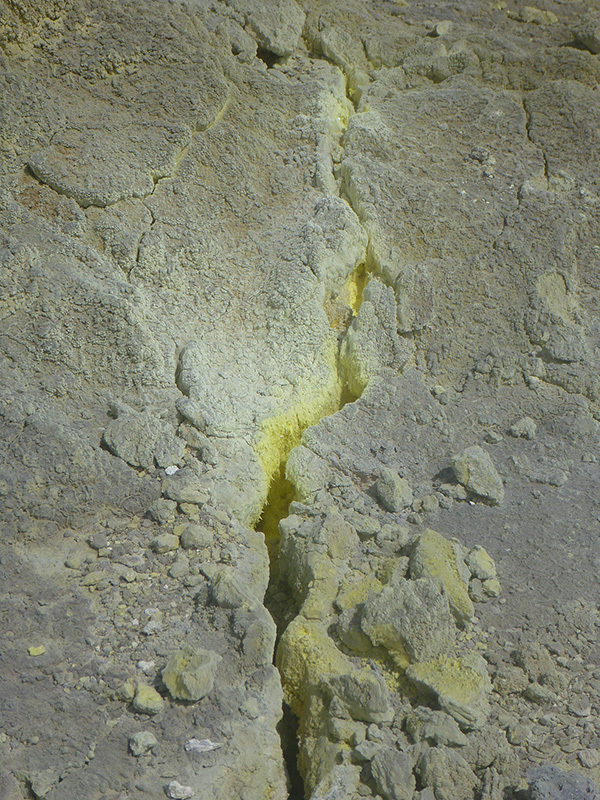 There were cracks and fissures in the crust over which you could scald your hand, if you held it above them too long, on the hot gases escaping from the inner planet! 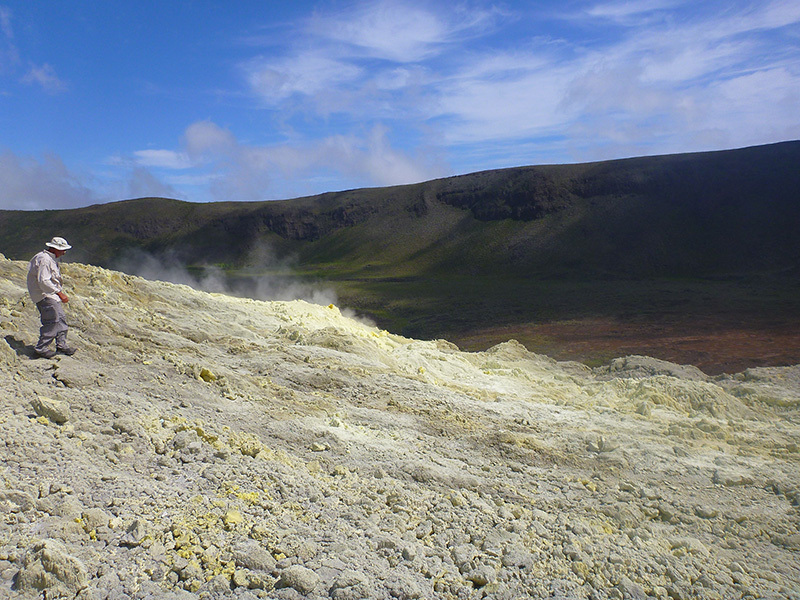 The volcano exhaled steam and sulfur (dioxide?) 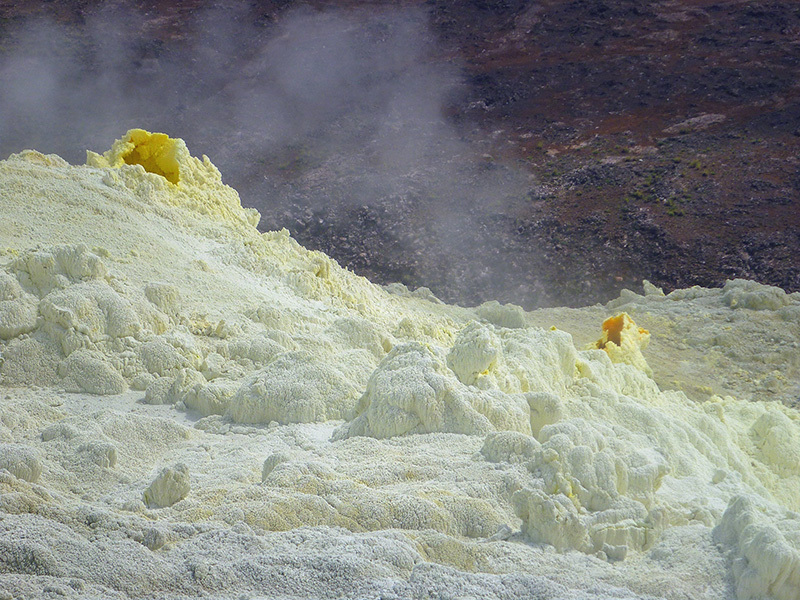 gases through larger vents. 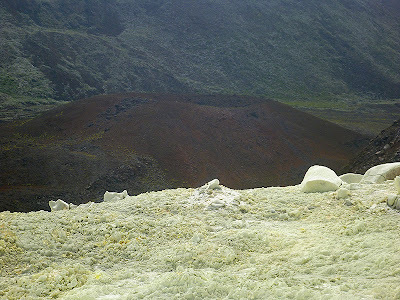 If the wind was right, you could walk close to them and actually look inside the vents and hear the sound of the hot gases escaping along with the wind blowing over the vents. 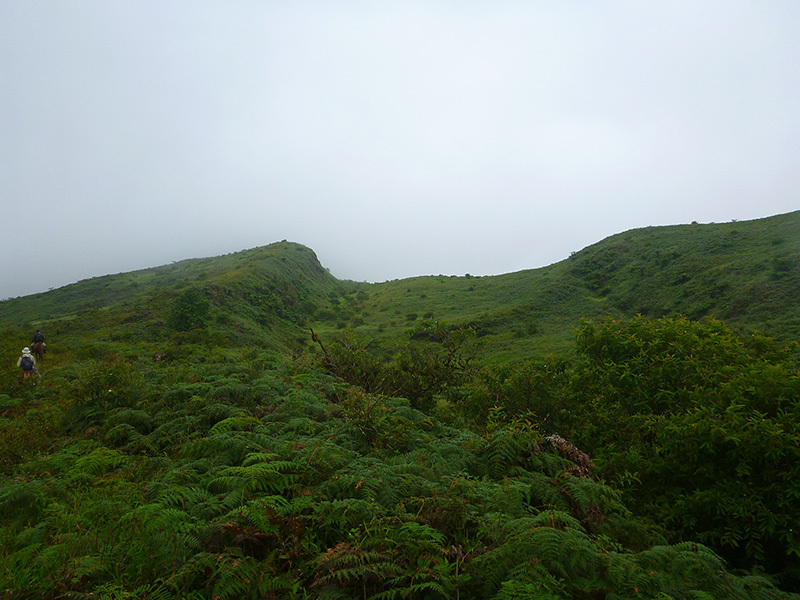 But when the wind changed suddenly, we made a massive retreat, throats and nasal passages burning, to higher ground. This spot was truly one of the most amazing places I've ever been. 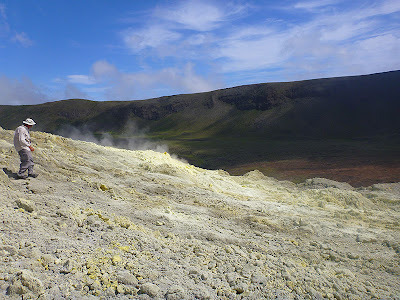 Then, it was back down the slope of volcanic debris, across the lava plain, and up the steep trail to the caldera rim. All of the children on this adventure with us completed this climb under their own steam. While the youngest rode on their parents' horses, they did all the walking themselves. The horses moved faster on the return trip (the proverbial "horses back to the barn" effect), but by the time we got back to the boats, it had been a full twelve hour day. 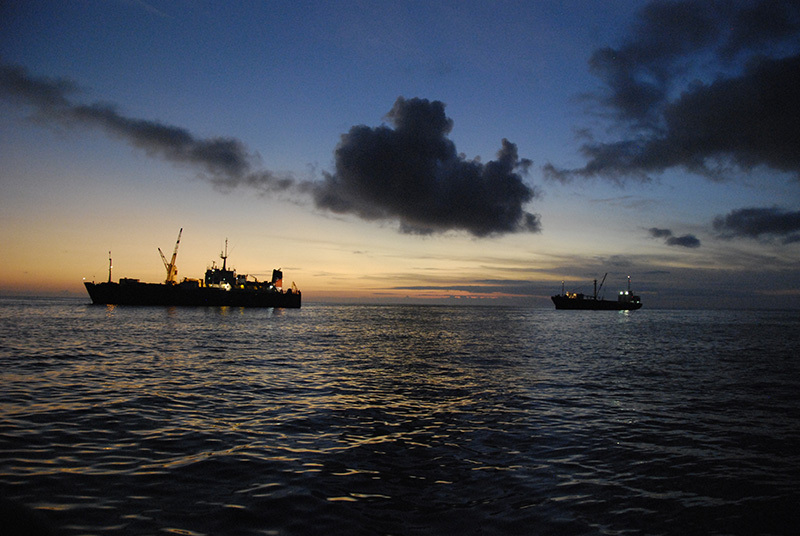 As darkness fell, some of our preparations for sea went by the wayside, and the rest were completed the next morning before getting underway. Showers and dinner were the order of the evening before we collapsed, exhausted but happy, into bed. 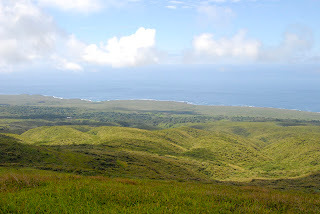 One of the highlights of our visit to Santa Cruz was the tour we booked to Seymour Island. Just north of Santa Cruz, across the Ithabaca Channel, is the island of Baltra. This is where the airport serving Santa Cruz is located, and it is also one place where American soldiers were stationed during WWII. 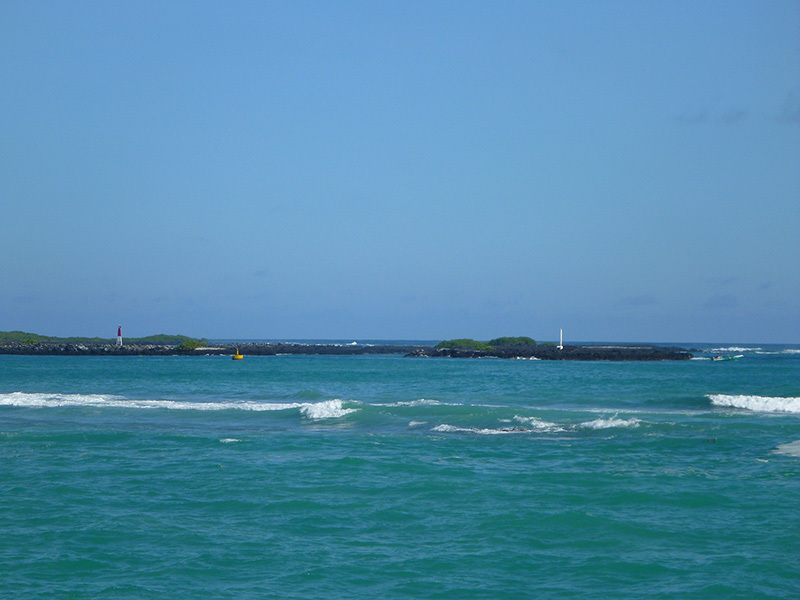 (The soldiers called it "The Rock" because it is basically just a flat island made of blocks of hardened lava. 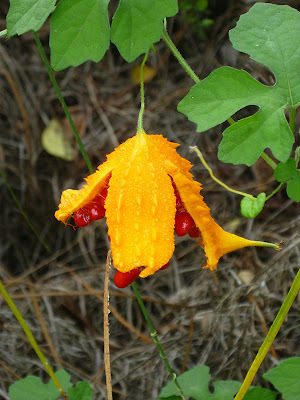 There is some vegetation, but there was probably less vegetation sixty to seventy years ago.) Just north of Baltra is Seymour Island. We took a bus across the island from Santa Cruz to the ferry dock at the northern end. 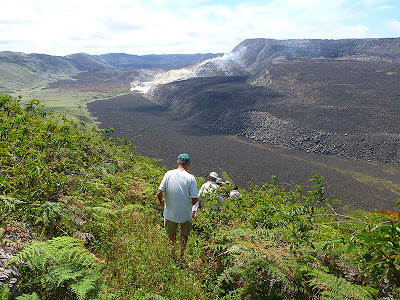 We crossed part of the Santa Cruz highlands and were able to glimpse Los Gemelos, the large volcanic craters formed by collapsed gas bubbles in the lava. At the northern end of the island, we boarded our tour boat. We had a very international tour group comprised of: a French couple, a Korean couple, a Scot, a Swede, a Spaniard, a German, a Peruvian couple, and us. Our first stop was along a point at the tip of Santa Cruz Island for snorkeling. There was some confusion among the tour group regarding the snorkeling excursion (more about that in a separate post); however, some members of the group saw white-tipped sharks and others saw a manta ray. The visibility was surprisingly poor (perhaps because it had been raining recently), but I saw many surgeon fish and a few more parrotfish. After snorkeling, we were given a hot lunch on the boat and made our way to Seymour Island. En route, we saw tropic birds and boobies nesting on cliffs. 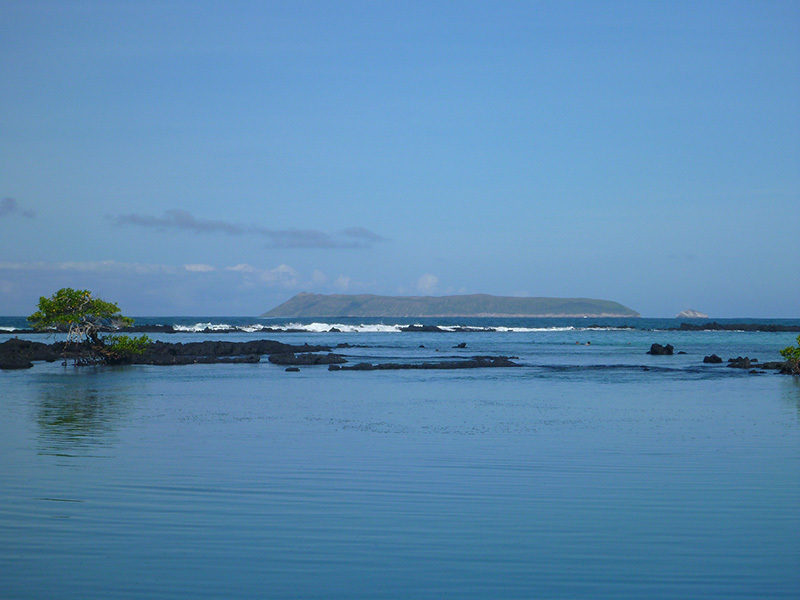 As the boat stopped in a small cove (where we transferred to the dinghy to go ashore), two huge Galápagos sharks circled around the boat and dinghy, affording us good views in the clearer water. Seymour Island is uninhabited and is a nesting ground for great and magnificient frigatebirds. While these species are not endemic (native) to the Galápagos, it is rare to be able to observe them as closely as visitors to Seymour Island can. We took a hike around some of the perimeter and inland areas of the island. 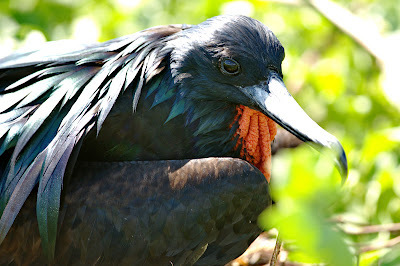 Here, we saw the frigatebirds in all their life forms: males, females, juveniles, and even a couple of chicks. 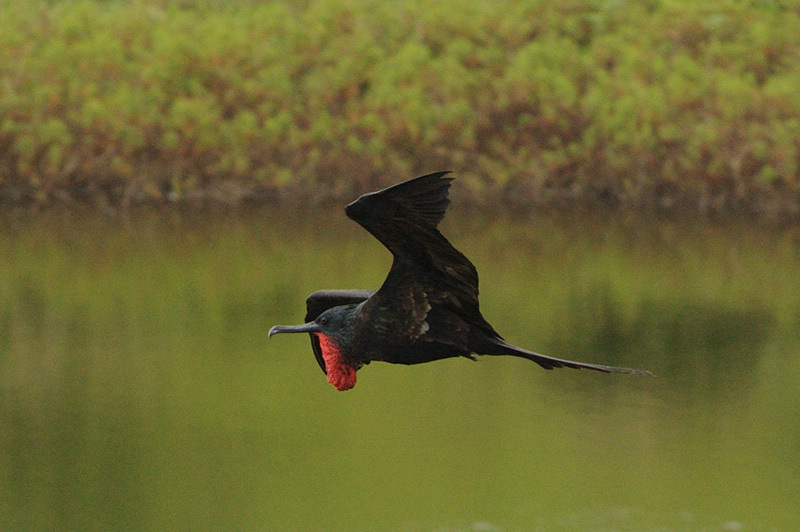 Great frigatebirds have iridescent green coloration on the black feathers just behind their neck on their backs, while magnificient frigates have purple colored feathers. 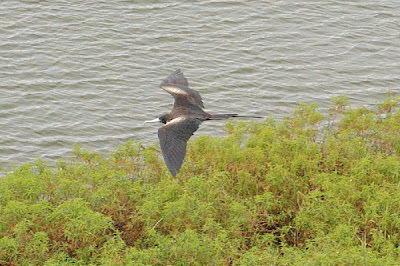 Females of both species have white chest patches. 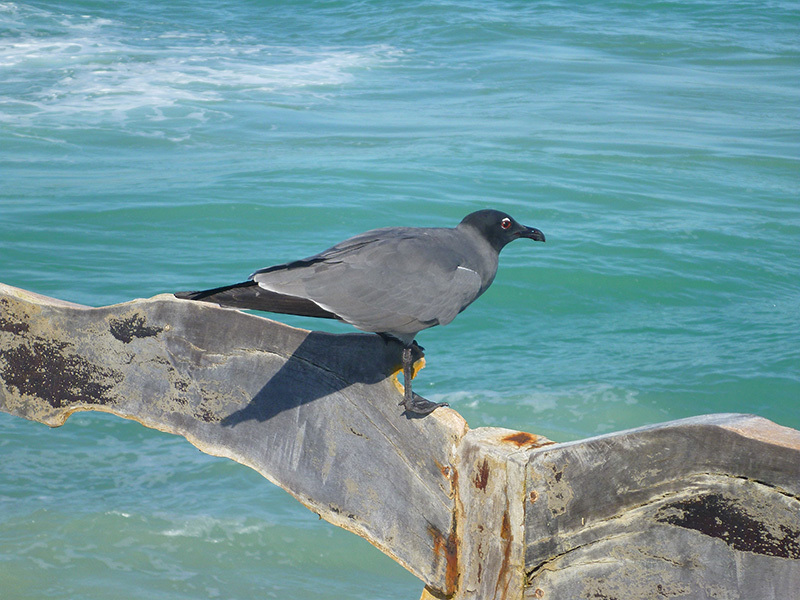 The most desirable male, in a frigate's eyes, is the one with a throat pouch as big as his body. (Sarcastic comment censored.) We had a very knowledgeable naturalist along as a guide, and he taught us that the males with the red throat patch inflated are still looking for a mate, while those with deflated pouches were already "married." 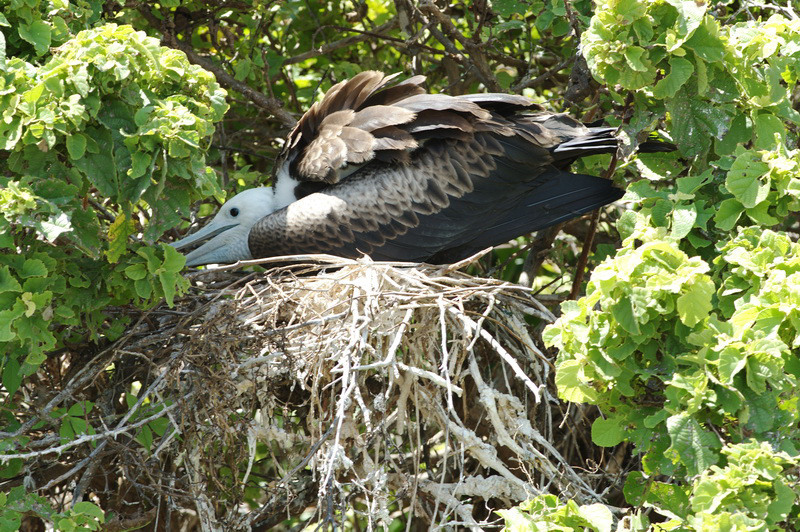 Frigates, we learned, are also not monogamous; and after a chick is hatched, the male leaves the female alone to feed it while he goes off and mates with a new female. 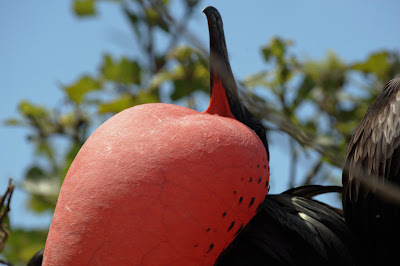 We were very excited to observe the mating ritual in which the male frigate "drums" on his throat patch to attract the female. The noise sounds exactly like a drum because the elastic throat pouch is tightened when inflated. 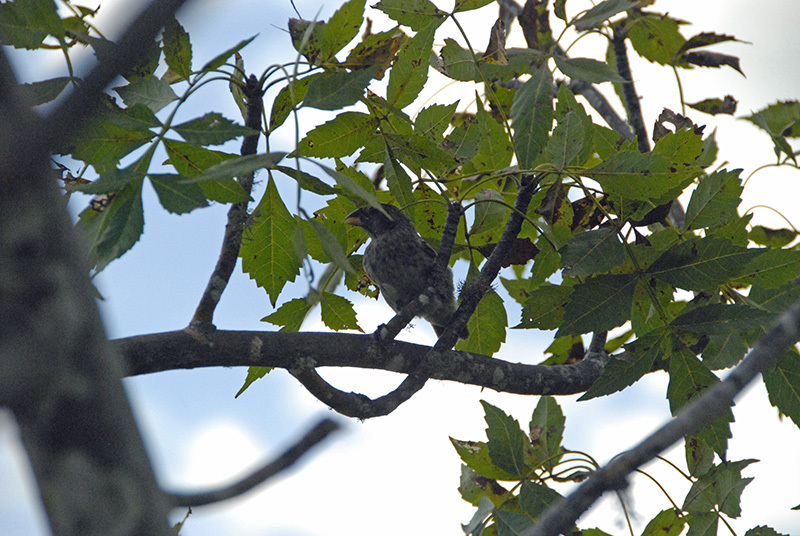 We observed a female drawn into the sound of the male's thrumming and some initial overtures towards mating. 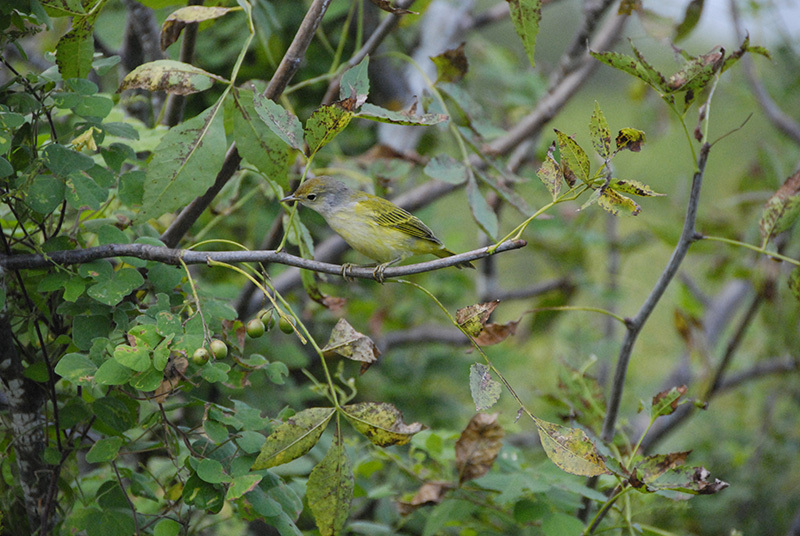 However, the female eventually decided that the male was unsuitable and flew off. Our guide explained that even the males with the biggest throat pouches must first build a nest if they are going to be successful in attracting a female, and the frigate we were observing had no nest! We were lucky enough to see one female sitting on eggs. The couple of chicks we saw were already four to six months old, but they still retained their fuzzy white down. We saw numerous juvenile frigatebirds, who are easily identified by their white heads. 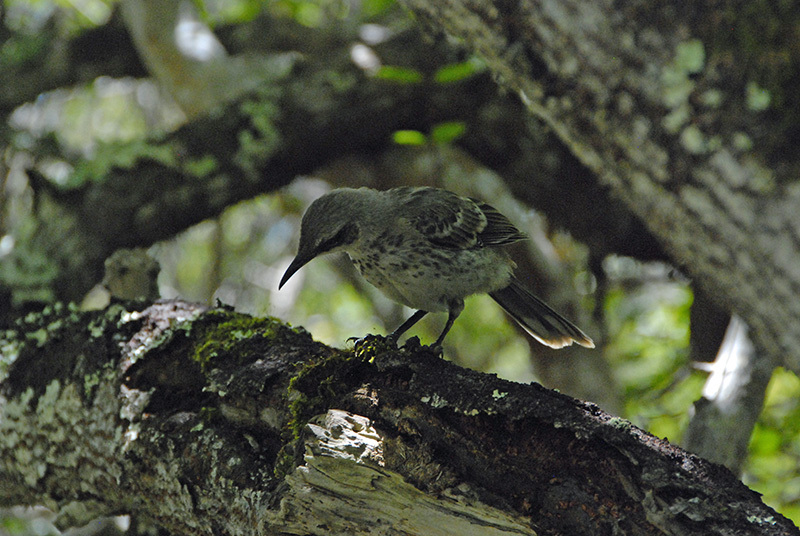 The picture below shows a juvenile sitting on a nest. Our guide explained that even though the juvenile is old enough to fend for itself, it is easier to sit on the nest and let mama feed it. It was very hard not to draw parallels between the behavior of frigatebirds and some human beings! Finally, we learned about the unique feeding behavior of the frigatebirds. 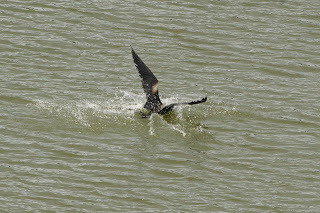 Our guide succeeded in changing my view of the frigates, who engage in a feeding strategy known as kleptoparasitism (stealing food from others). Frigatebirds have to steal their food because even though they are seabirds, their feathers have lost the waterproofing ability of those of other seabirds. Unlike boobies, pelicans, and albatross, frigatebirds cannot dive below the surface to catch fish. 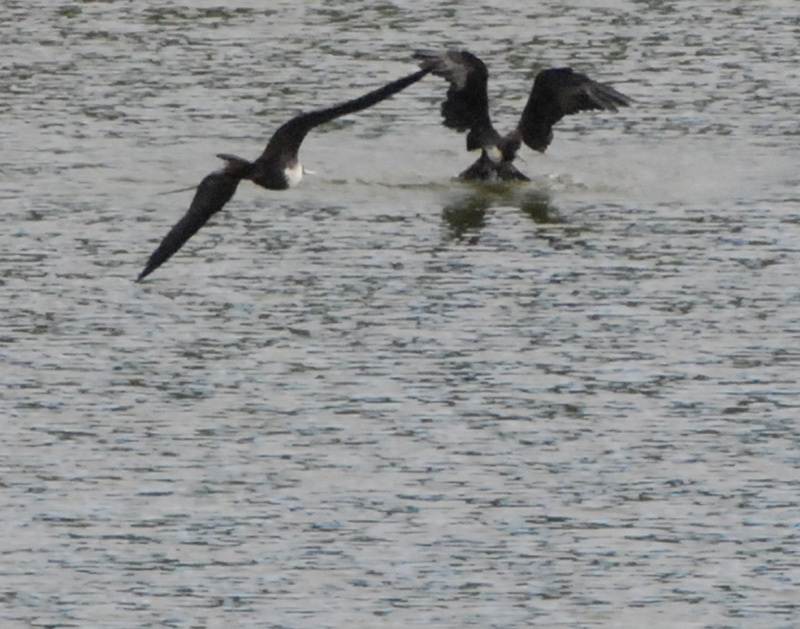 Thus, they must steal from other birds (and even from each other when a mother disgorges fish to feed her young.) 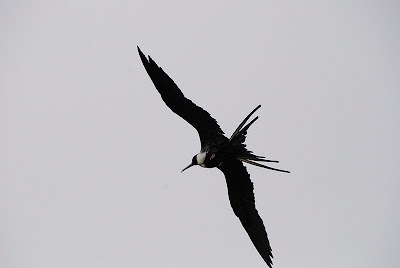 We learned that the frigatebird is the lightest seabird (indeed, their appearance is very slender compared with the other birds mentioned) and that a pile of their bones would weigh about as much as the sum of their feathers. 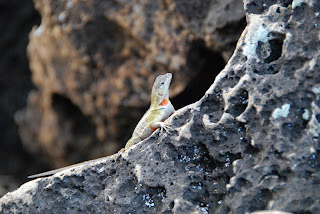 While hiking along the island, we also saw our first Galápagos dove as well as many lava lizards. 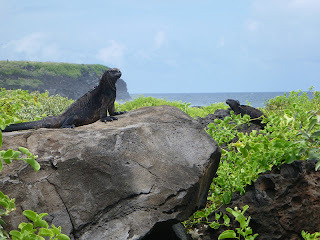 Seymour Island is also home to a large number of terrestrial iguanas, which are an endemic species to the Galápagos---although not, as we learned, endemic to Seymour Island. 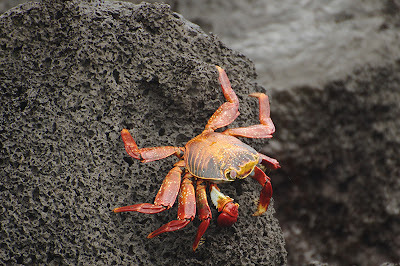 Their unique ochre and rust colored scales/skin provide excellent camouflage for blending into the volcanic soils of the islands, where their chief predator---the Galápagos hawk---strikes from above. 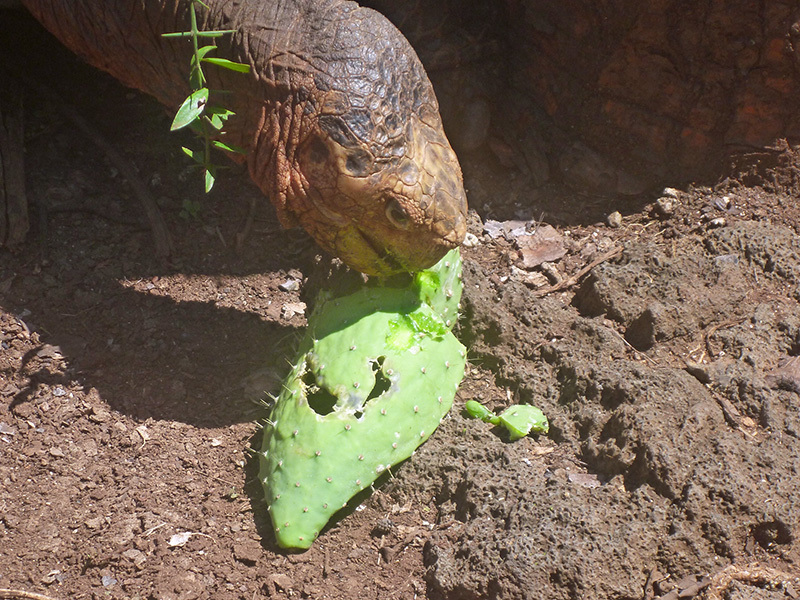 The iguanas are threatened on Seymour because they are depleting their main food source, the Opuntia cactus. 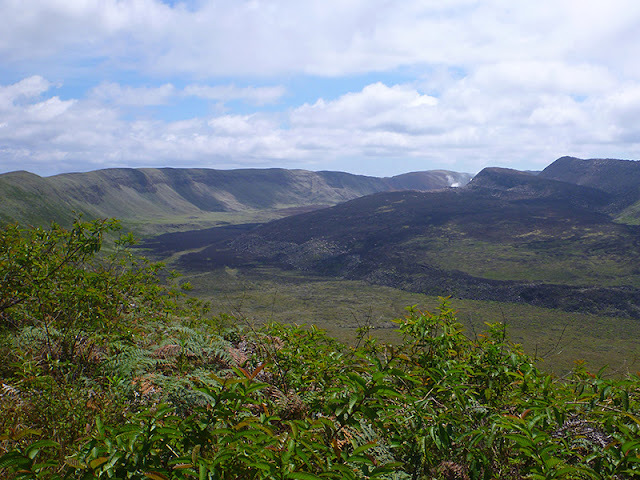 Since the terrestrial iguana was somehow transported to Seymour from another island, the flora of Seymour island has not co-evolved with the iguana. 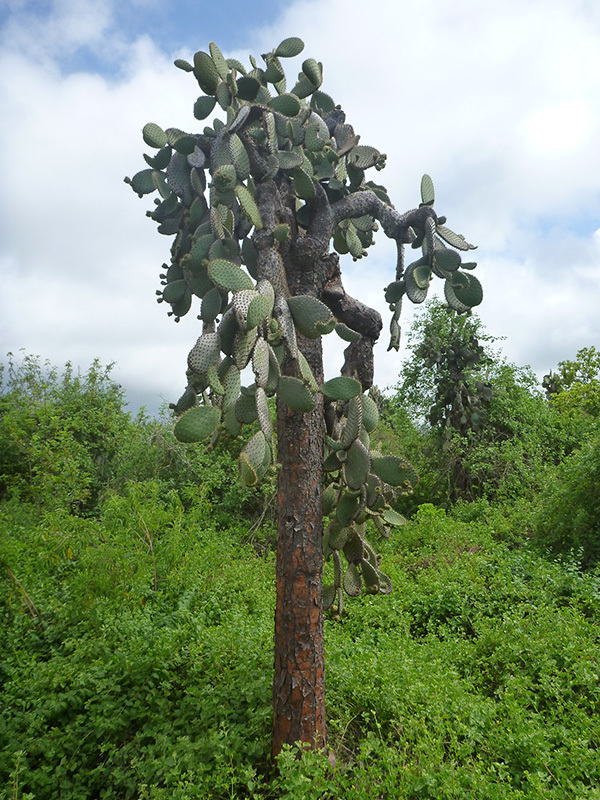 The Opuntia cactus on Seymour Island is the short form. It has not developed the adaptation of the hard trunk we saw in the tall cactus on Santa Cruz Island that makes it resistant to predation. If the iguana eats all the cactus on Seymour Island, it may not survive there. 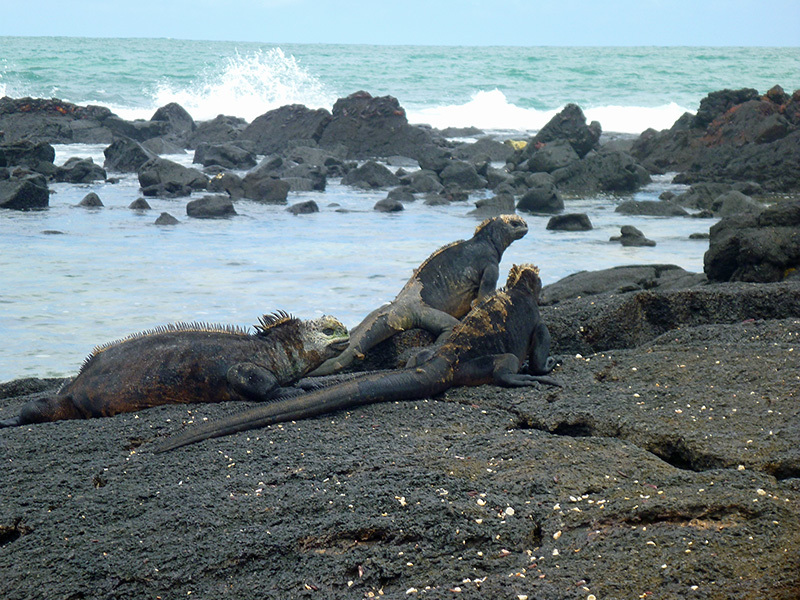 Along the sea coast of the island, there are blue-footed boobies, marine iguanas, and Galápagos sea lions. The blue-footed boobies occupy hummock-shaped boulders in order to conduct their mating ritual. 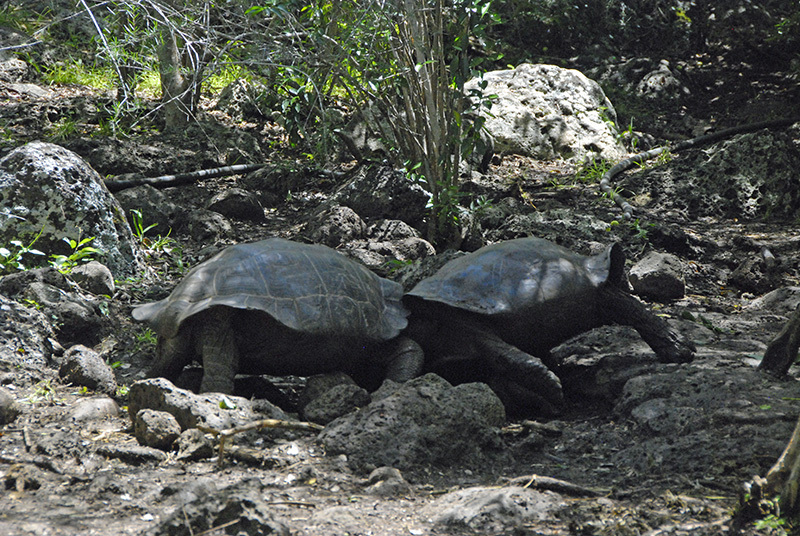 The female stands on the boulder while the male tries to get her attention. 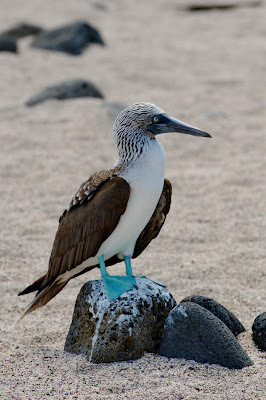 Some in our group were tempted to compare the ritual to human interactions, because the female booby stands there preening her feathers and looking bored while the male clamors for attention. 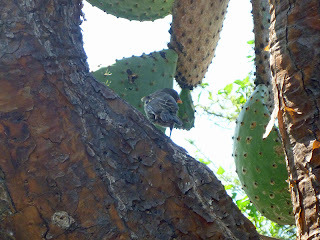 As we observed in Mexico, the male then "dances" by showing her his feet. 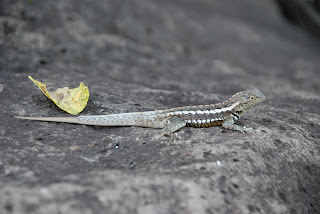 Our guide said she is looking at not only the size of his feet, but checking them for wounds and other imperfections, to determine whether he is suitable breeding material. As we made our way back to the boat at the end of the hike, we saw two swallow-tailed gulls. I would rate this tour, along with snorkeling at Las Tijeretas (on San Cristobal), as one of our best wildlife viewing experiences in the Galápagos. 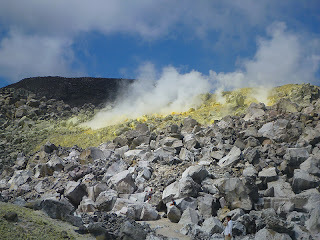 The photos for this post will be added when we get to French Polynesia. 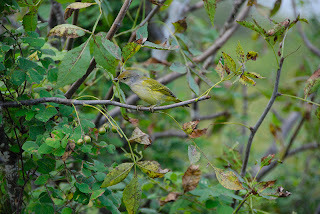 Since the shutter on the good camera I was using broke, and the digital camera was experiencing condensation issues, all of the credit goes to Patrick for the wonderful photos in this post. 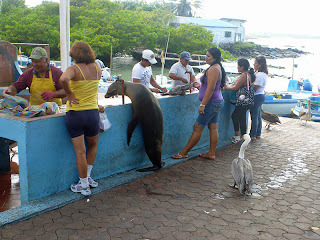 Puerto Ayora also has a night life that is not wholly designed around tourists. On Saturday night, you can find much of the citizenry out enjoying themselves in the open air. Couples and families are out walking in the streets or dining in restaurants. A favorite gathering place for youth is the cement sports field along the waterfront (used for organized sports like volleyball at other times) which is transformed into a skate park on Saturday nights. Older youth congregate in small groups around the fringes of the skate park or can be found draped over the kiosk on the water taxi dock, absorbed in their laptops. 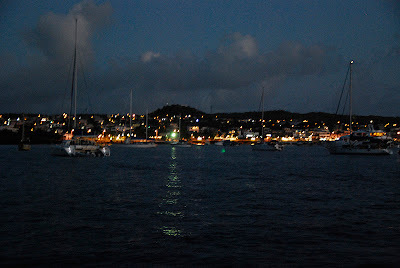 While the port is cheerful and colorful, the anchorage in Academy Bay is crowded and rolly. The anchorage is open to the southerly swell. There are some lava reefs extending out into the harbor (though not nearly as many as on Isabela), and you can't anchor too close to shore for that reason. One advantage to the rolly anchorage is that you won't lose your sea legs while in port! 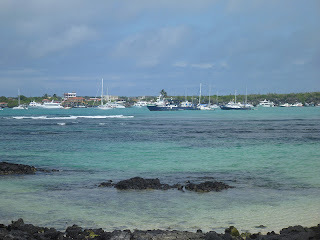 We were lucky enough to arrive at a less crowded time and were able to find a decent spot to anchor; however, more boats arriving after our initial days in Santa Cruz left me wondering where we would anchor if we were just arriving. We had read that many people use a stern anchor in Academy Bay, and we found this to be good advice. We put out a stern anchor which helped significantly with the rolling. 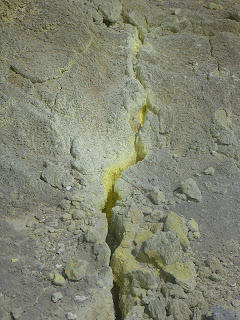 Be prepared to clean your bottom after leaving Academy Bay, because a healthy layer of slime (algae) will grow along the waterline (at least at this time of year). 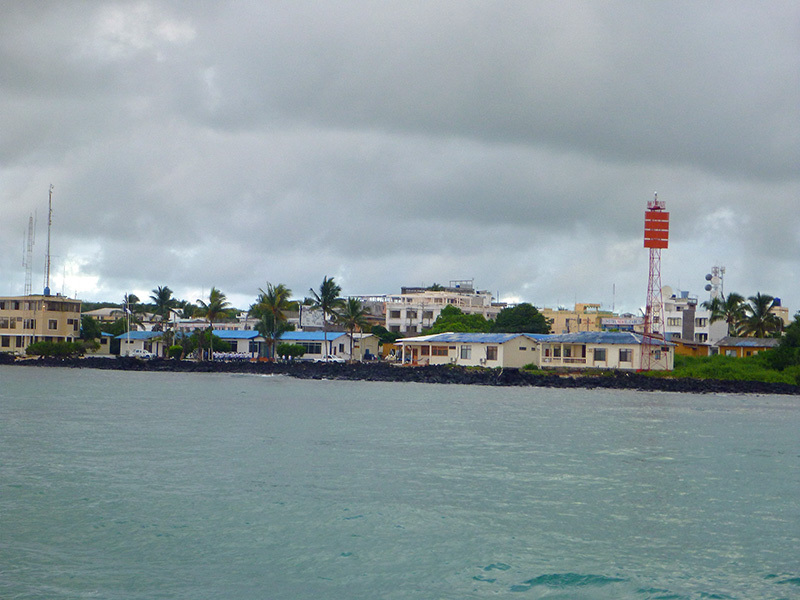 We arrived at Puerto Ayora just before five p.m. and after anchoring, we tried to call our agent on the VHF to see if we would check in that day or the next morning. We received no response and decided to wait until the next morning. We called again the next morning and still received no response, so we water-taxied in and walked to the agent's office. We found no one there, but a kind neighbor told us the secretary was at the bank and would be back shortly. We took a walking tour of town to get the lay of the land and returned when the secretary was back. This time, both the secretary and a representative of our agent were in the office. (Our actual agent was on Baltra.) The agent's representative---Santiago---was the most helpful and business-like representative we dealt with from the agent's office, including the agent himself. Santiago arranged for us to check in. 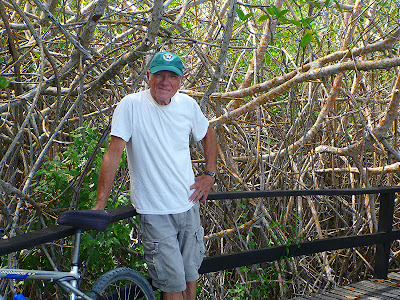 Later that afternoon, the Port Captain and a staff member from his office met Santiago and us at the boat. We were told they would need to inspect the vessel, but they were satisfied with the answers to some preliminary questions we had given to Santiago. These questions focused on a gear list and the number of people on board. 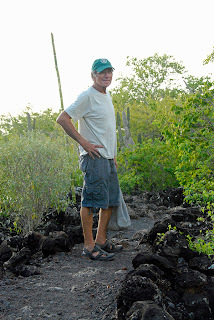 The Port Captain of Puerto Ayora at this time is a friendly, personable individual; indeed, he is the only official we met who has made us feel welcome in the Galápagos. 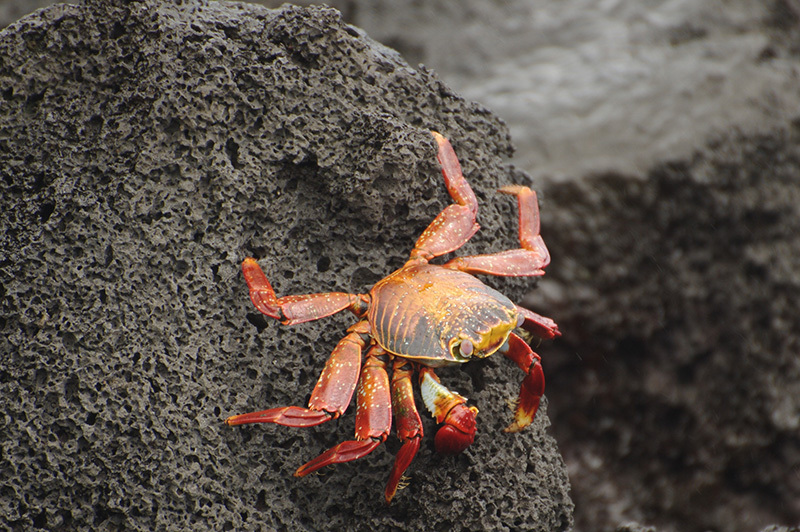 There is a lot to see and do locally in Puerto Ayora, and we missed some of the best marine sites (Bahia Tortuga and Punta Estrada) due to our limited amount of time here. 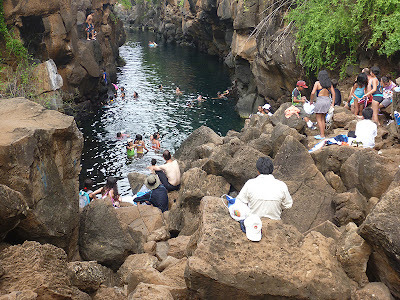 However, a wonderful memory was visiting Las Grietas, a local hangout and swimming hole created by a fissure in the volcanic rock. 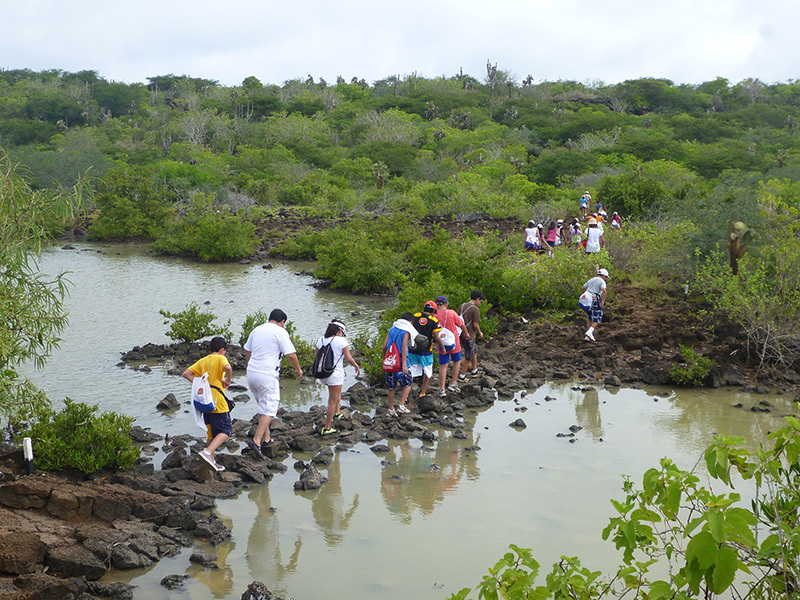 During our hike to Las Grietas, we were passed by group of school children visiting the island from mainland Ecuador. These kids were from the big city of Quito and didn't get exposed to the outdoors a lot. 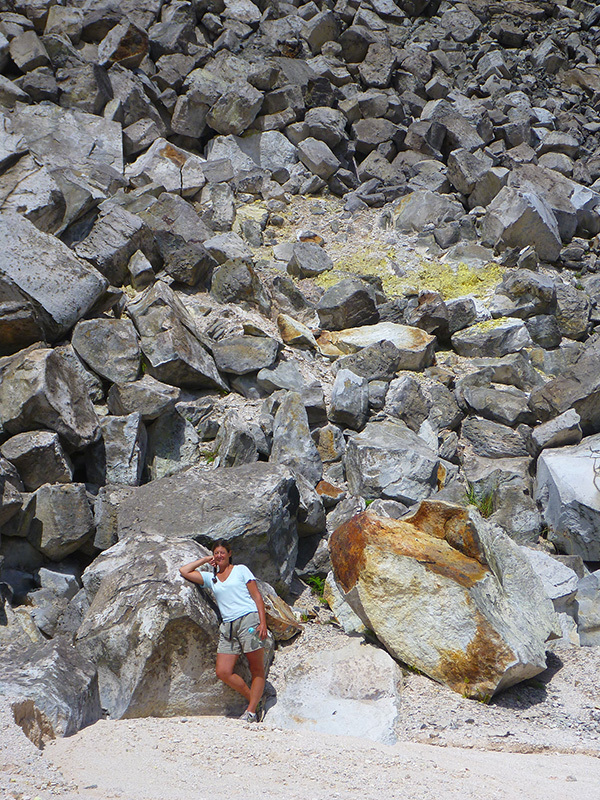 The hot hike over the lava rocks was challenging for some of them, but when they got to the swimming hole, they had a ball. Although our solitude and visibility for snorkeling were interrupted, we couldn't help but enjoy the shrieks and laughter of the happy children. Our noisy group also interrupted the solitude of a native swimmer at Las Grietas, a young man in his teens or early twenties. However, this Santa Cruz islander thrilled us all with daring feats of cliff jumping from the rocks surrounding the fissure. (I got video, but probably won't have a connection fast enough to upload it.) 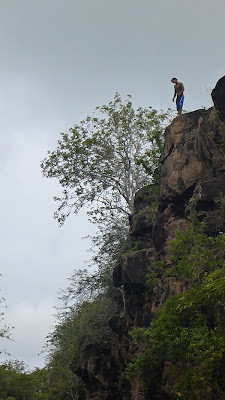 The children were in awe and quickly followed suit by jumping off rocks proportional to their own size and skill level. See those little things that look like butterflies skimming across the surface of the water? Or sometimes, they look like a flock of small birds: the kind that turn in flight all at the same time so the dark topsides of their wings change synchronistically to the light undersides. Those are actually schools of flying fish. 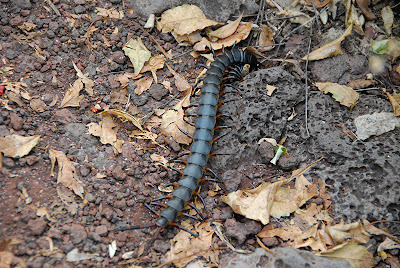 The ones we are seeing are only about three to four inches long. On a trip to Santa Catalina Island (thanks, Mom! ), I learned that flying fish don't actually use their wing shaped fins to "fly;" rather, they propel themselves with a rudder-like fin extending below the aft end of their bodies. You guessed it. We are at sea again, underway for the Marquesas. We are leaving the land of Spanish, chorizo, and blue-footed boobies, and are about to enter the land of Marquesan/French, poisson cru, and fruit doves. It is our fourth day out, and already this voyage has a different flavor than the last passage. We found the wind immediately and have been clipping along at a good 5.0-7.0 knots for the majority of the time. The first couple of days, the average wind speed was only 8-10 knots, but it made a huge difference to have it on our beam instead of on our nose! Last night, I think we found the trade winds with steady winds of 13-16 knots and gusts up to 18 knots. The weather is also cooler on this passage (at least so far), making it a lot more comfortable. I also feel the void a bit more on this passage. 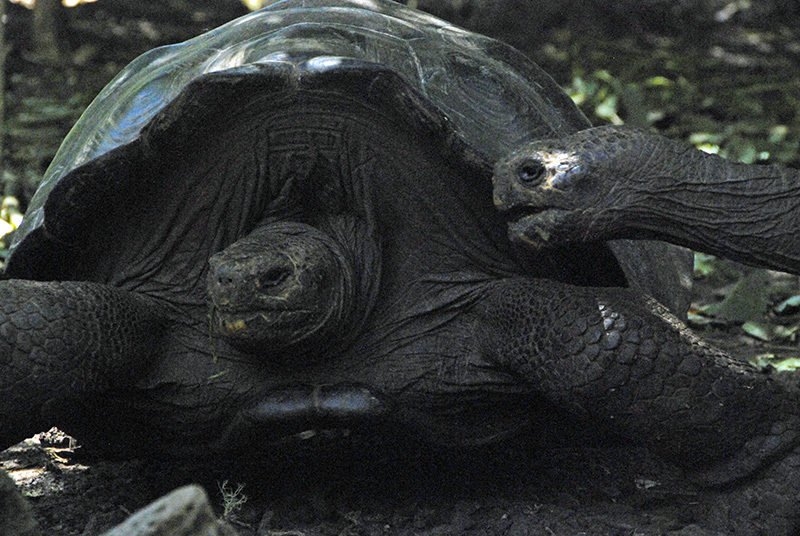 On the way to the Galapagos, we always had the land masses of Mexico, Central and South America to the east, even though they were hundreds of miles away. Now, we are surrounded by nothing but water in every direction. 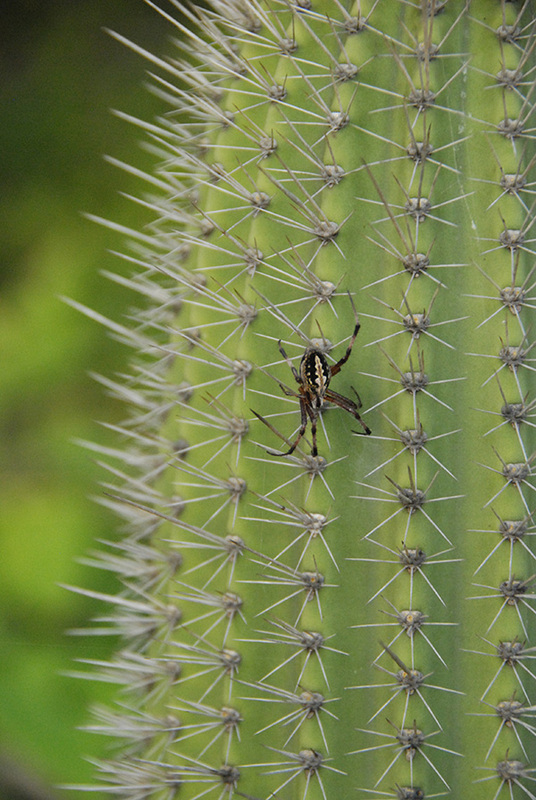 We've also already had our share of unusual occurrences. We spent the better part of our first night at sea dodging longliners and their gear off the south end of Isla Isabela. Although the longlines had flashing markers on the end of the gear, it was difficult to tell in the dark where the two opposite ends of a longline were---and steer around them---if you could see three or four markers at a time. Early the next morning, Patrick put our fishing line in the water. He immediately hooked something and called me up from below to assist. What he had hooked was part of a longline. There was no telling how long we had been dragging this piece of longline which, further inspection revealed, was also caught on the bobstay fitting at the bottom of the bow and hung up on something under the boat. We could have snagged it the previous night or just that morning. I steered the boat up into the wind to slow it down, while Patrick set about trying to free the line from Silhouette. Patrick hauled the line attached to our fishing lure and dragging behind the boat aboard until we saw it come up with floats still attached to it. He had to cut this major portion of the longline free. With the boat hook, he was able to release the portion of line snagged on the bobstay fitting. He freed as much of the line as possible from the fittings on the boat but had to tie off the portion of the line caught under the boat. 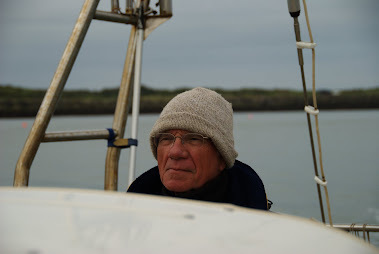 Since we were under sail, we didn't need to address the problem right away, and the swells were too big to consider going into the water for further investigation just then. However, if the line was also caught on the prop, we didn't want to get into a situation in which we needed to use the engine and couldn't. Later in the afternoon, as the glare disappeared from the water surface behind the boat, we saw that we were still dragging a long piece of line from behind the boat. This piece seemed to originate further down. We decided to stop the boat in order to get the (polypropylene) line to float. We took down sail, and as the line floated, Patrick was able to grab it using the boat hook. He slacked off the line he had tied off on the stern (also running under the boat), and lo and behold: the two were connected! We could not have been luckier as the line was simply caught under the rudder and not wrapped around the prop or shaft. We were able to pull all the remaining line on board, completing the task of freeing Silhouette from the gear. We regret that we damaged someone's fishing gear; but it was unintentional, and there was not much we could do to set it right after the fact. We feel for those fishermen who, going to check their line, will find it missing. We count our blessings that our boat was not disabled. Another unusual encounter occurred when we spotted a panga with two fishermen in it. They were 100 miles from the nearest land in an open boat(a panga)with horsepower attached. We wondered if they needed help, but the men seemed to go about their business unperturbed as Patrick brought Silhouette near. Suddenly, one of the men waved at us, and they changed the panga's course to intersect with ours. The panga went astern of us and drew up along the starboard side. "Tiene algo para comer?" the man in the bow asked, "Tengo hambrecito." ("Do you have something to eat? I am a little hungry.") I asked if they had anything to cook with, and they said no. We were out of bread to make sandwiches, so I tried to think of what I could grab that would be quick yet filling---as the panga was running alongside Silhouette, herself racing along under a full main and headsail. I opened two cans of chili con carne and grabbed a couple of apples from the V-berth. I asked if the men had forks/spoons (yes), and Patrick and I passed the food over. I didn't think of what I could put into a goodie bag for later or to ask if they had enough water before the panga was already pulling away from Silhouette with a shouted "Gracias!" So begins our journey to French Polynesia. We did not have an internet connection from the harbor on Isla Isabella, our last stop in the Galapagos, and the internet cafe was closed on the day we tried to visit it. I (Kirsten) have not been able to read personal email since around May 13, so if I didn't respond to something you sent, I apologize. 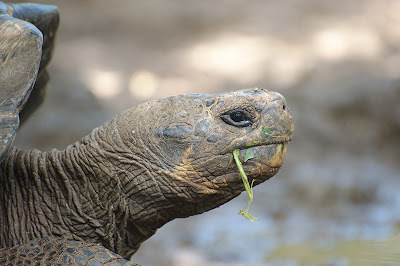 I had some blog posts about the Galapagos ready that I will upload from sea, but I will have to add the pictures retroactively the next time I get an internet connection. In general, it is getting harder and harder to connect to the internet. 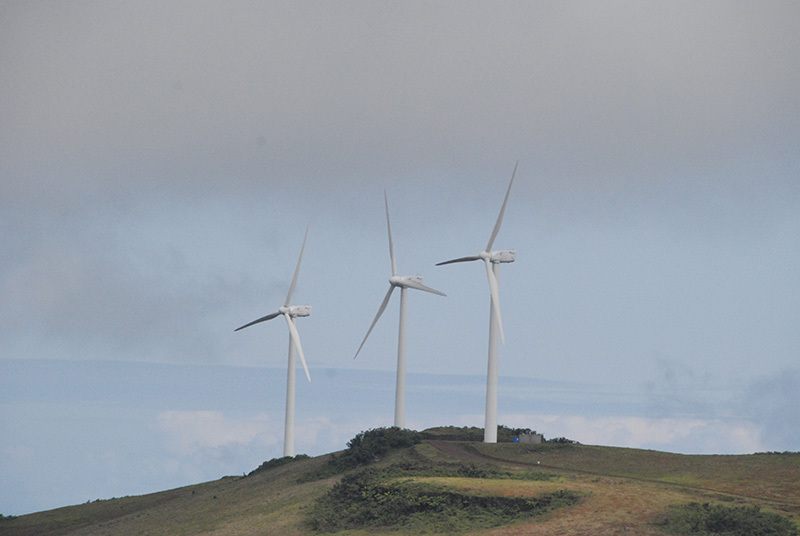 (Even on San Cristobal and Santa Cruz islands, power outages frequently affected the internet cafes, and there won't be any internet cafes on most of the islands and coral atolls in French Polynesia!) 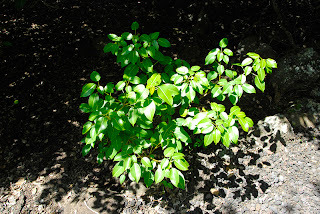 So expect fewer pictures in blog posts from here on out---but we will still post photos when we are able. 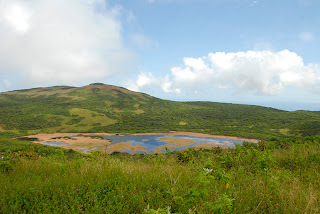 One of the first things we did on San Cristobal was to take a walk up Cerro Tijeretas or “Frigatebird Hill.” While we saw no evidence of nesting frigates there (and only a few soaring over the beach below), we saw a myriad of other wildlife. First, we took a lava trail connector to the interpretive trail. 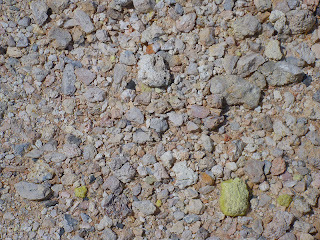 On the lava trail, we saw our first lava lizards. As with much of the other wildlife on the Galapagos, different islands have different species of these ubiquitous reptiles. Even spiders appeared new and different, since we were at the Galapagos. 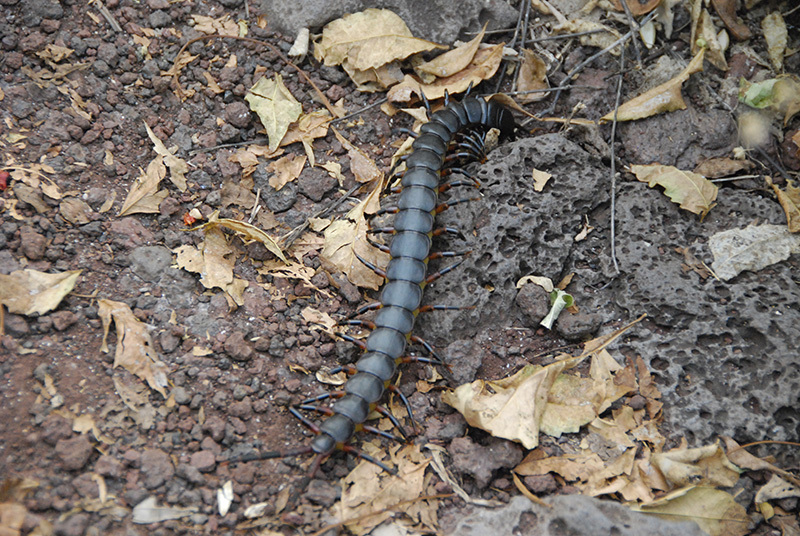 We also saw this gnarly centipede. It was eight or nine inches long! We spotted the first of “Darwin’s finches,” and saw many more of these as we made our way up the interpretive trail to the viewing platform at the top. A few days later, we took a tour of the island which included several interesting wildlife habitats. 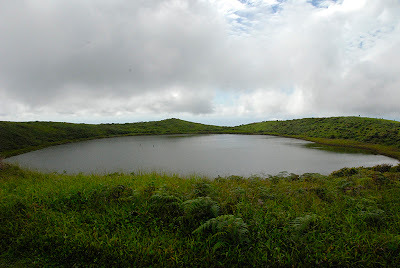 The first was Laguna El Junco, a freshwater lake in the crater of an extinct volcano. 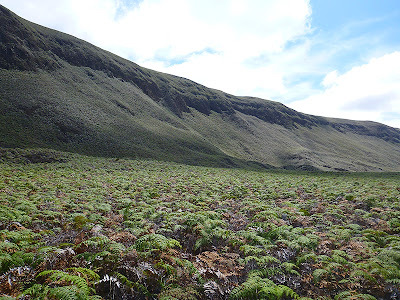 The volcano is only about 600 meters high, a short but steep hike up a path and wooden staircase.The volcano’s slopes house the Miconia plant, an endemic shrub whose habitat is disappearing. The crater was smaller than I’d imagined and is one of the only, if not the only, source of freshwater on the Galapagos islands we visited. and one of the most picturesque (in terms of its setting) HAM radio stations in the world. 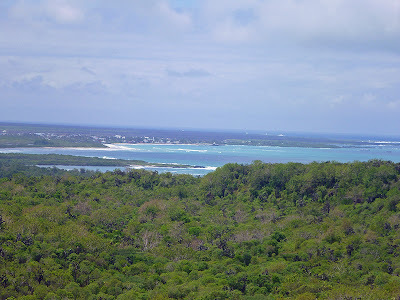 We also had beautiful views of the north, west, and southwest coasts of the island. 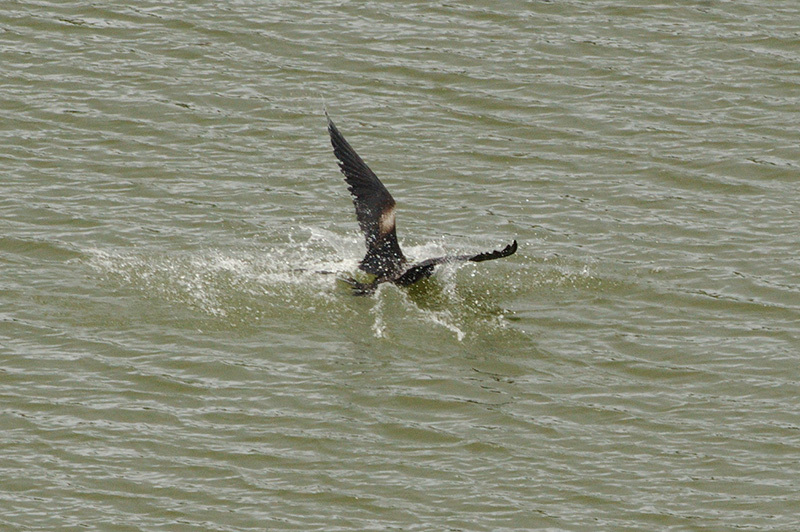 However, the highlight of El Junco are the frigatebirds, who go there to wash the salt crystals off their feathers. 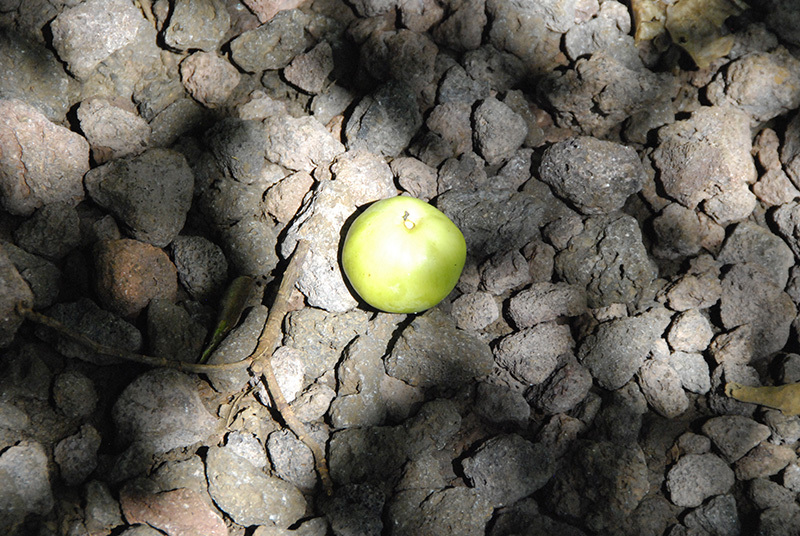 As we toured the island (in a small tour group of three which included us and a German sailor), we saw some of the many tropical fruits growing on the island: banana, papaya, guava, passion fruit, and mandarins. We later learned that the guava covering much of the island is an introduced species. I also wonder about the mandarins we saw, since one I had onboard was confiscated upon our arrival. 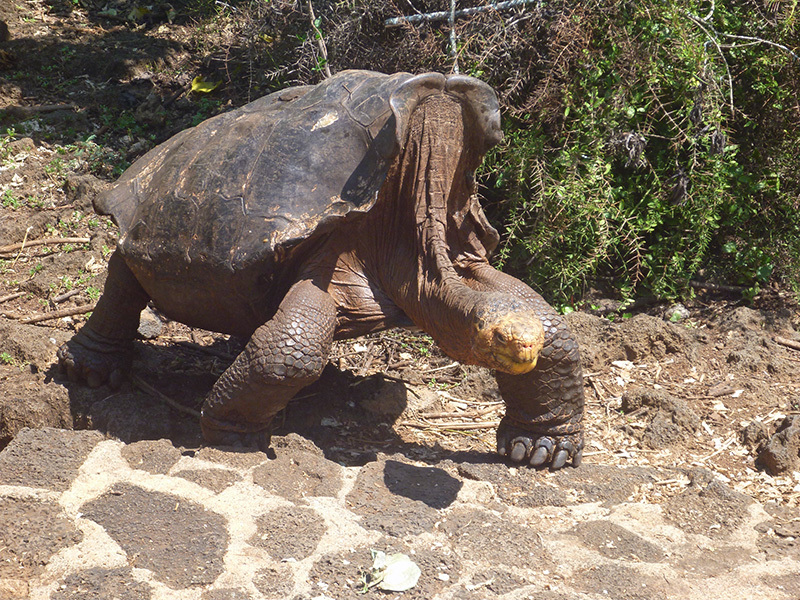 We next visited the Galapaguera Cerro Colorado, a giant tortoise breeding center. Even though the Galapagos are known for its giant tortoises (of which there are currently 11 subspecies left), these magnificient animals are threatened by a variety of human activities. 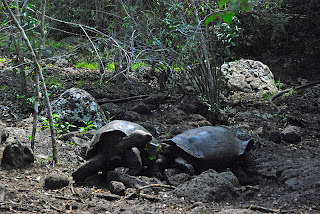 On San Cristobal, conversion of their natural forest habitat to other uses and predation on their eggs by introduced species such as rats and feral cats are two factors contributing to the turtle’s struggle for survival. 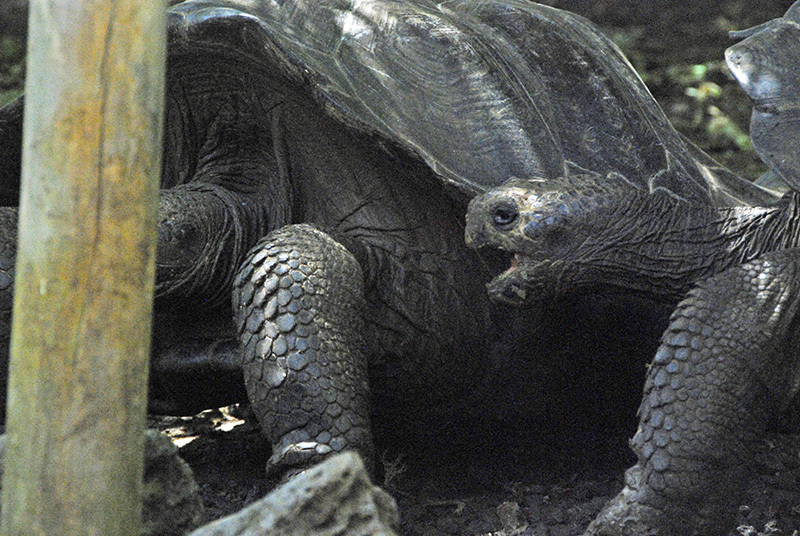 At the breeding center, they give the tortoises a head start by removing the eggs from the wild, incubating and raising them in a nursery, moving the turtles to an adaptation pen between two to five years, and then returning them to the wild. 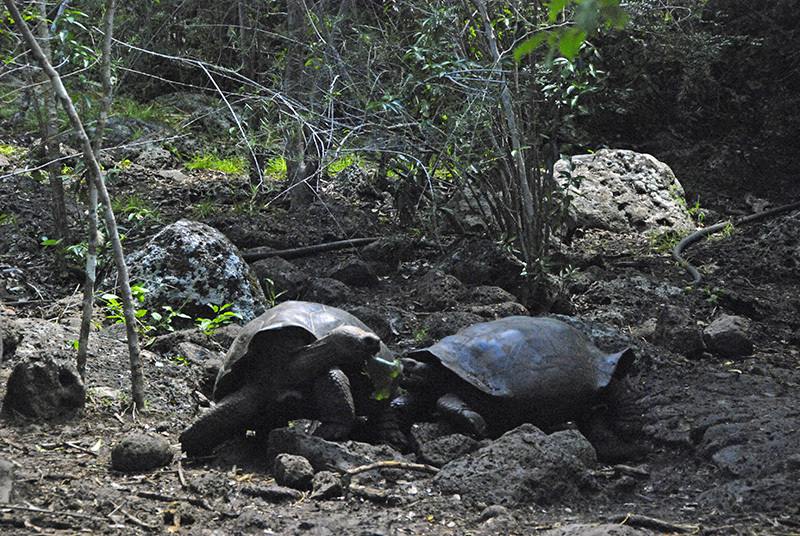 At Galapaguera Cerro Colorado, we were able to observe some of the native plants in the tortoise’s natural habitat. 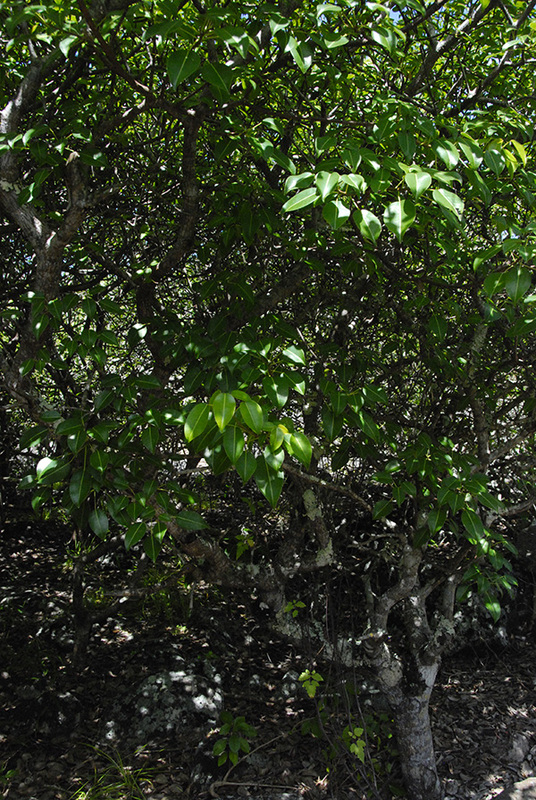 One of the most important for people to know about is the manzanillo, or poison apple tree. While highly toxic to humans, and found in many other places on the island, this plant is an important part of the diet of giant tortoises on San Cristobal. 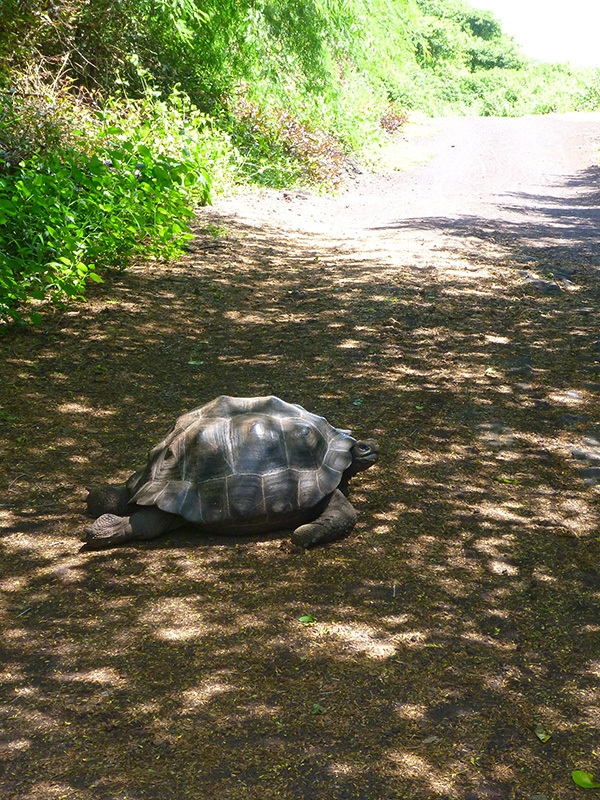 While not a completely natural setting (the park creates feeding and water stations near the trail to draw the tortoises into view of the visitors), you are pretty much guaranteed to see some giant tortoises at the Galapaguera. 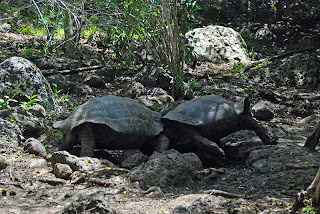 Not all of the tortoises remain at the feeding stations; however, and we did observe others along the trail and under the foliage. 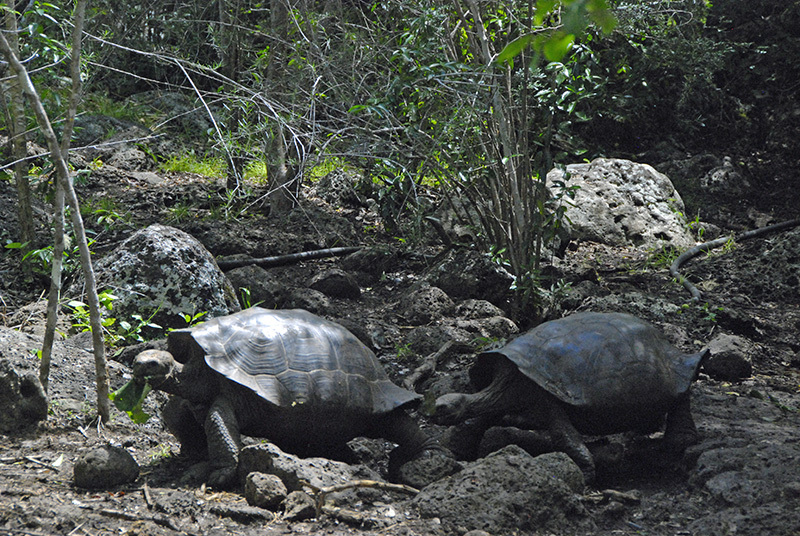 We were able to observe some of the older tortoises, who ranged anywhere from 60 to 100 years old. The females were smaller than the males, but both sexes exhibited some territorial behavior. Here, one male challenges another male for (what looked like) the space he was occupying. Another inhabitant of the forest was the San Cristobal mockingbird. 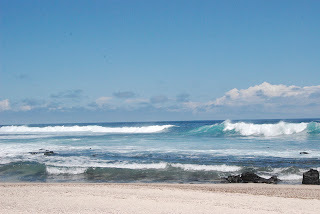 Our last stop of the day was La Loberia, a sea lion rookery and popular surfing beach. 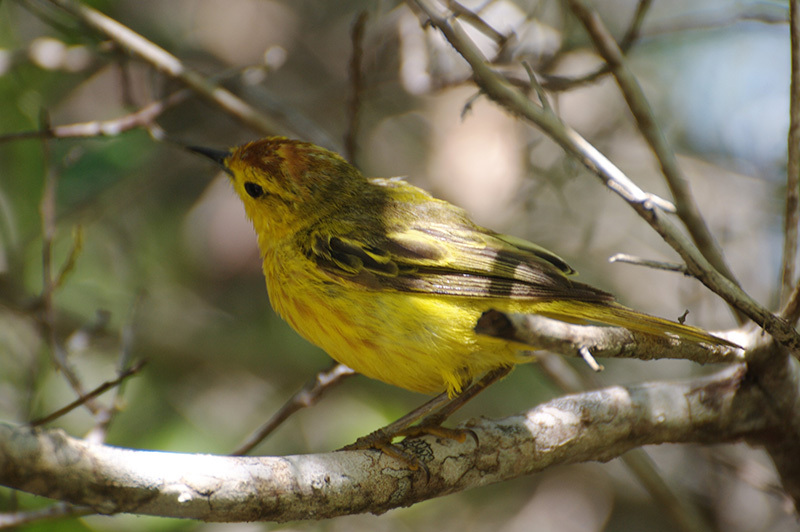 Here, Patrick finally captured one of San Cristobal's bright yellow warblers on film. 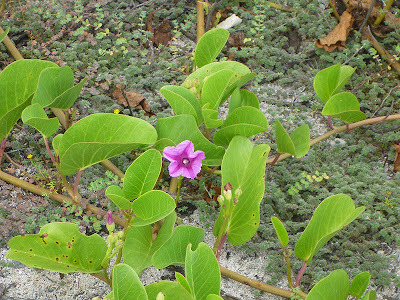 We also saw a native beach morning glory. 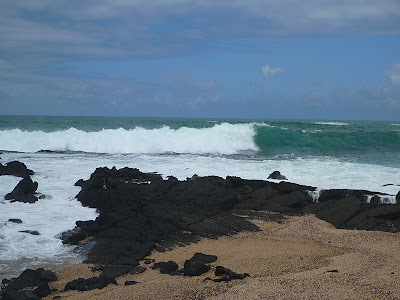 We were supposed to do some snorkeling at La Loberia, but it was too rough on the day of our tour. 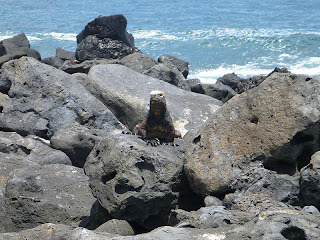 While we saw many sea lions---which I wrote about in the last post---we were only able to see one or two marine iguanas. 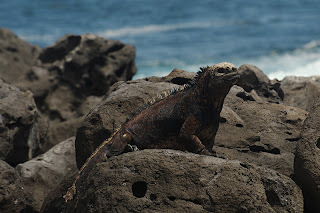 Due to the tide coming in, the iguanas had fled the basking rocks near the surf zone and had crawled under the beach vegetation for their siesta. We could see the tracks their tails left in the sand. As Patrick remarked, “It’s even too hot here for the iguanas!” We learned that it is best to visit the beach during low or slack tide if you are in search of marine iguanas. 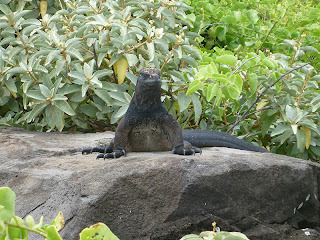 ....we were much more successful in viewing iguanas! We saw some of the older, mature iguanas basking on the lava boulders near the surf zone. They were confident in their aura of cool, unperturbed by our presence. They sit still as statues and indeed, their mouths look like they are composed of granite. Only their warm golden eyes give any indication of life. Further on down the trail, past the sea lions, surfers, and crab zone, we found many younger iguana. 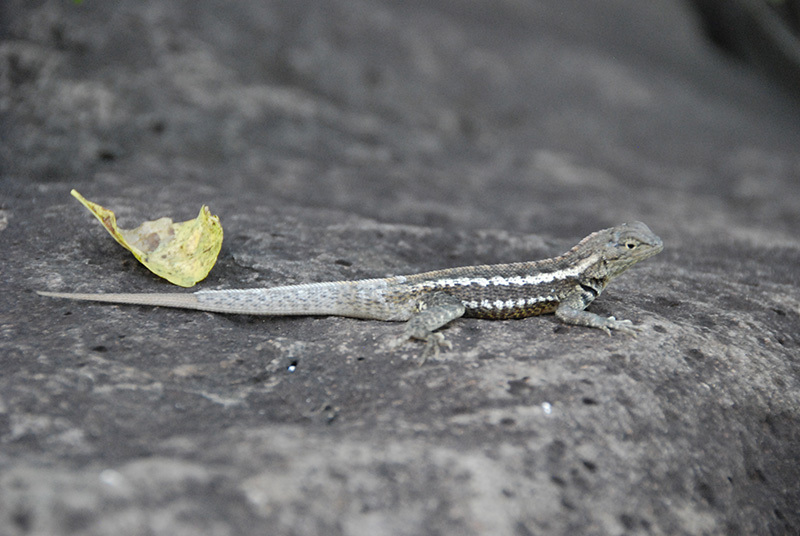 These were smaller in size and a little more wary of us. 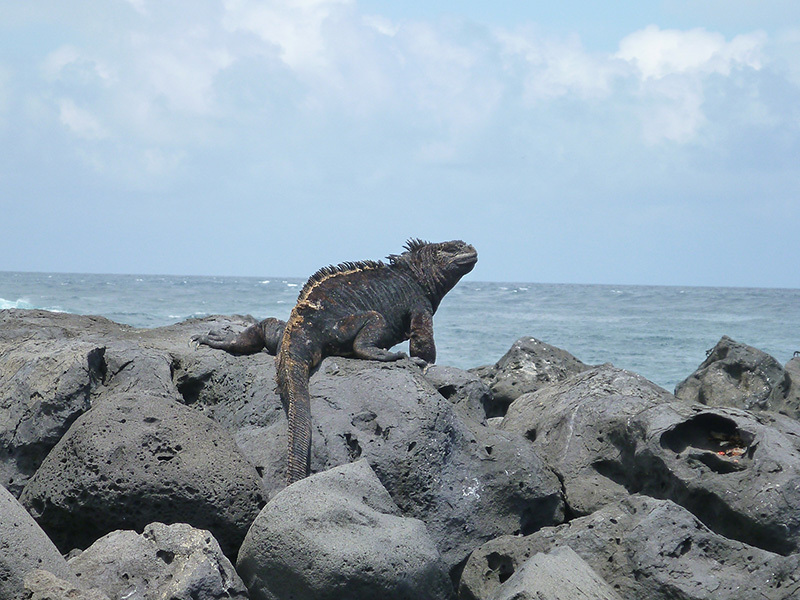 “Older” and “younger” are relative terms: I don’t know the life span of a marine iguana. 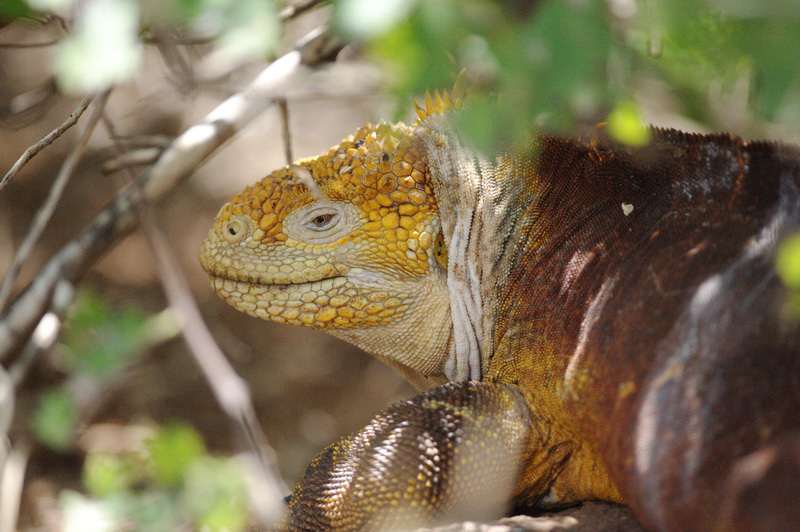 Reptiles, in general, are long-lived, and we later learned that a terrestrial iguana can live to up to 60 years old. 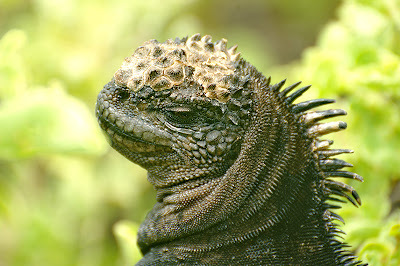 I assume the life span of marine iguanas is similar. As we checked out of San Cristobal, we felt like we’d seen most of what the island has to offer. This was our first stop in the Galapagos, and we ended up losing a lot of time on logistics. (Check-in or waiting for aspects of check-in were spread out over parts of three days; arranging and receiving fuel delivery took the better part of a day; we needed fresh food and laundry done after a three-week passage; and check-out also took several visits to our agent’s representative.) 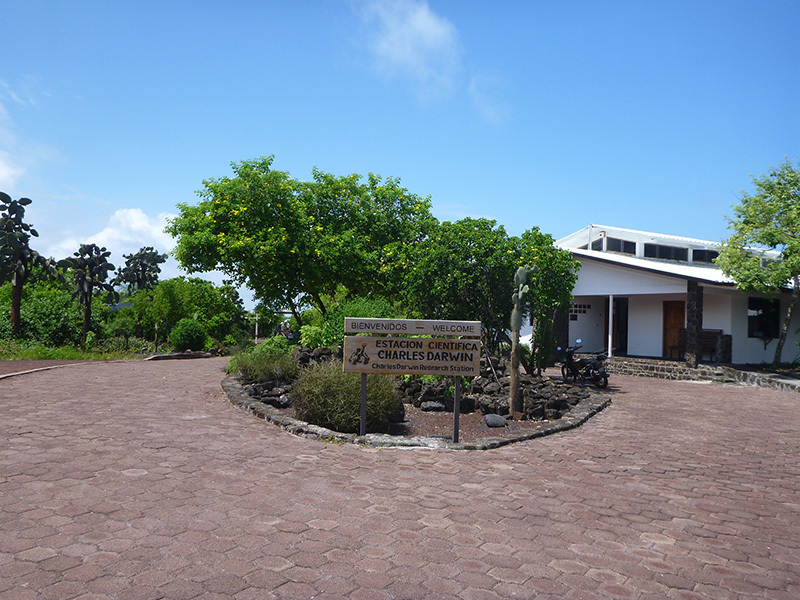 If I had it to do over, I would have visited the Interpretation Center early on to learn more about the island’s geology and history. 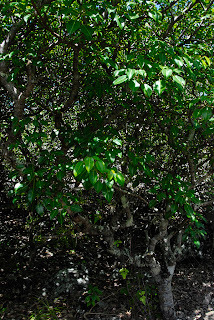 I also would have taken a tour to Punta Pitt, where we learned too late about the booby rookery and tropic birds you can see there. Overall, our stop on San Cristobal was a great introduction to the Galapagos wildlife and the Galapaguenses (Ecuadoran people who live in the Galapagos islands).